CTA 7261 is southbound on Halsted, at the intersection with Grand and Milwaukee Avenues. This car is incorrectly signed for route 42 (should be 8). One of the advantages of an electronic book is that it can be updated and improved as new information becomes available. 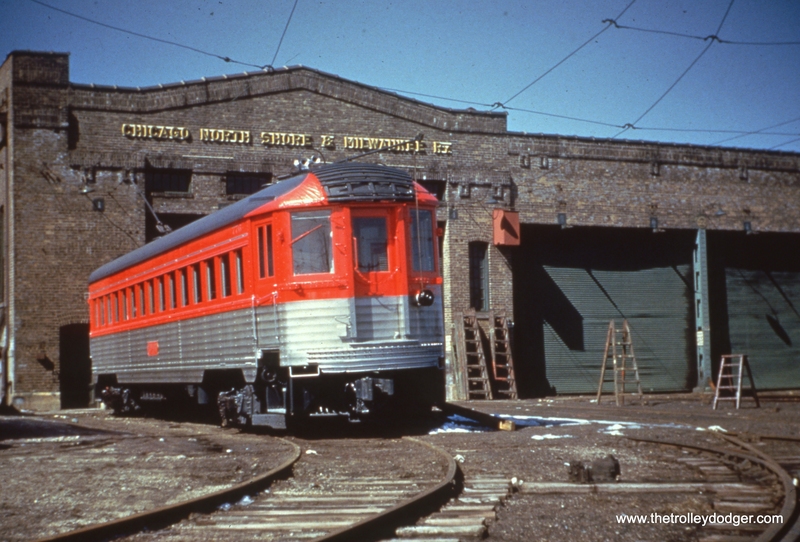 Today’s post features the latest updates to our E-book Chicago’s PCC Streetcars: The Rest of the Story, which is available in our Online Store. First off, we have acquired another rare supervisor’s track map from December 1946. 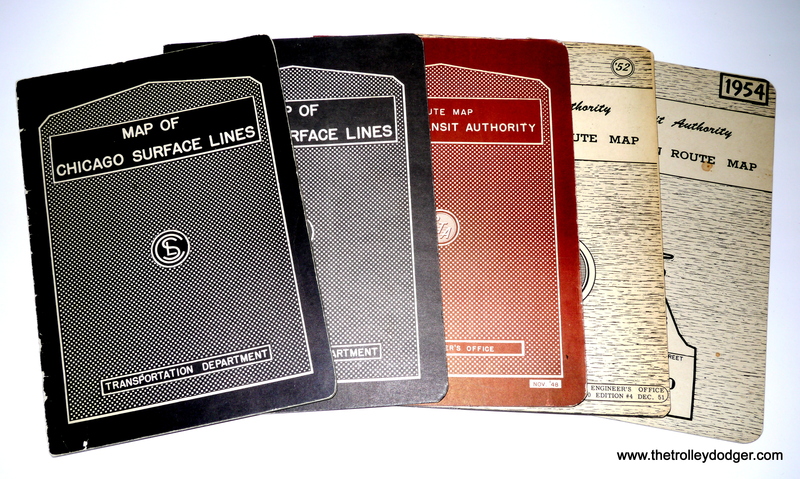 Now, our E-book includes the CSL maps from 1941, 1946, and the CTA versions from 1948, 1952, and 1954. These maps are much more detailed than the usual route maps and show the locations of crossovers, wyes, loops, stations (car barns), etc. etc. in great detail. They include the trolley coach and motor bus routes as well as streetcars. 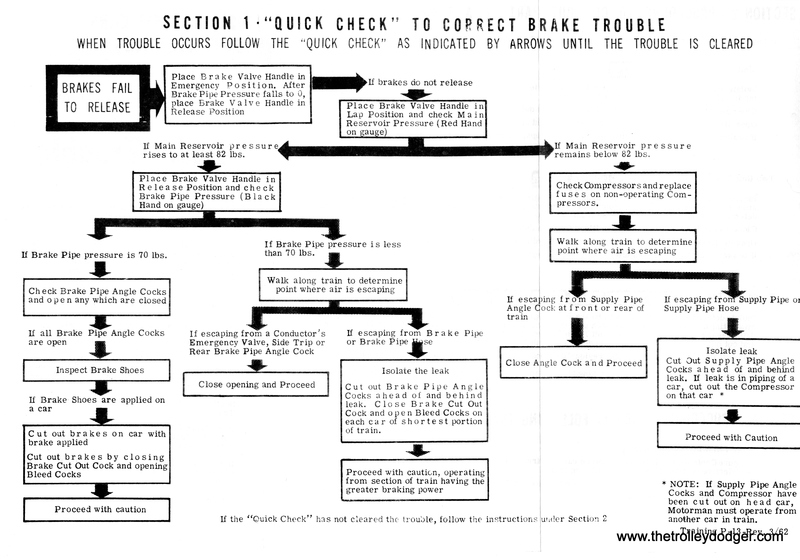 Our E-book now includes five supervisor’s track maps, from 1941, 1946, 1948, 1952, and 1954. Detail from the Chicago Surface Lines supervisor’s map from 1941, as featured in our E-book. We have also added more photos, some of which are reproduced here. Over the last few months, we have added at least 30 new photos to the book. If you purchase a copy today, you will receive most current version of the book. If you already bought one, we can provide you with an updated version at little or no cost. We can set you up to download the new files via Dropbox, a free file sharing service, at no additional charge. If you would prefer an updated disc, we can send you one for just $5 to addresses within the United States. Contact us at thetrolleydodger@gmail.com for further details. We want you to be able to buy the E-book with confidence that you will not miss out on any future improvements. I enjoyed the DVD Chicago’s PCC Streetcars: The Rest of the Story. I especially like the track maps of the system. My question — Is there any diagrams of the shops and barns? I am interested in the track arrangement of the yards. The Surface Lines had numerous “stations,” as the car barns were called. If we can get hold of the information, we will add it to the E-book, thanks. The revised disc arrived the day after you mailed it, which was quite surprising. The list of scrapping dates for each individual car was very interesting, hopefully the inservice dates for each individual car can be found and published in the future. Regarding the Pullman built cars, Lot 6749 for series 4062-4171, car 4062 was photographed at Pullman’s former Osgood-Bradley plant on 9-3-46, while car 4067 was photographed over a month later on 10-8-46, leaving me to believe that 4062 was shipped over a month before the rest of the cars started delivery. The Lot 6786 cars series 4172-4371, car 4172 was photographed by Pullman’s studio the E. B. Luce Company on 9-16-47 and car 4306 hoisted up by the plant crane has a photo date of 11-20-47. 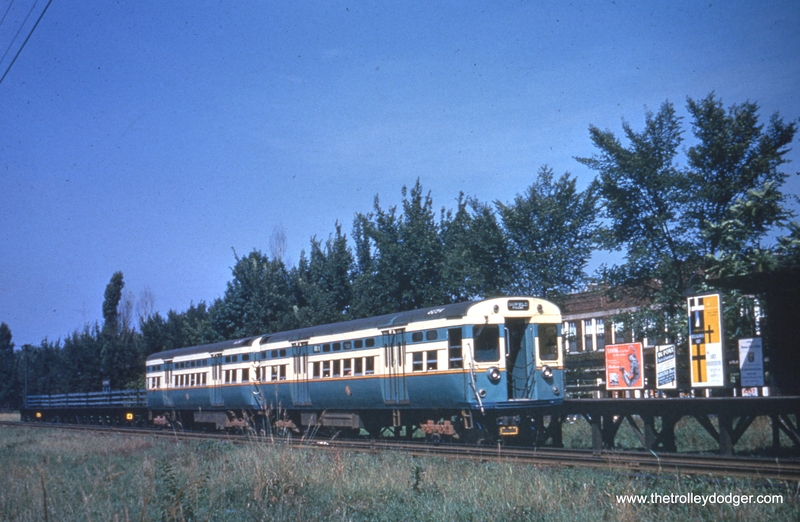 In the series cars 4172-4196 were delivered first, then deliveries jumped to 4272-4371 with 4197-4271 being the last. This may have been done because of the CTA trying to cancel the order. On your disc, Post War PCC’s #1, on Page 12 lower, page 15 upper and page 28 both views have photos dates of Oct. 1, 1949. I think they were taken later, probably 1951 or 1952. Per the Aug. 1950 issue of MASS TRANSPORTATION outside advertising on the CTA wasn’t authorized by city ordinance until 4-13-1950. Also, I doubt if any cars were painted dark green before the arrival of the propane Twin Coach 5000 series buses in late 1950. On page 13, believe location is Clark and Roosevelt. 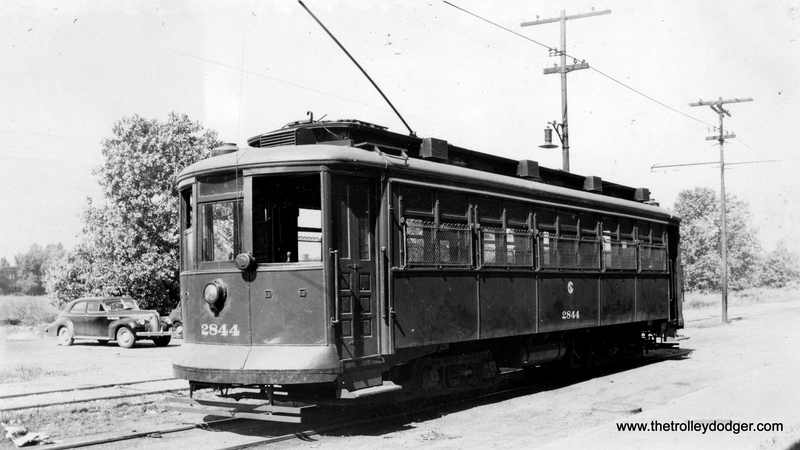 On page 26, lower view is of car 4055 not 4065. On PostWar PCC’s #2, Page 2, upper photo of car being towed, it’s probably headed to West Shops for repair, I have this print as well from the late Joe Diaz and it looks like there’s some body damage on the PCC. Pages 38 bottom view and page 46 upper view are 81st street looking east from Halsted. Thanks… we will make corrections to the captions you cite. Sometimes the information written on a print or slide turns out to be wrong. We know that the Chicago Transit Authority did try to cancel the PCC order, since this was reported in the press (see page 39 of Chicago Streetcar Pictorial: The PCC Car Era, 1936-1958, Bulletin 146 of the Central Electric Railfans’ Association*), but I believe this happened in 1947, not 1946. The newly-formed CTA, you may recall, was instrumental in getting the 600 Postwar PCC cars ordered in 1945. This was part of a long-range plan to modernize all of Chicago’s transportation systems, first published in 1937 (and detailed in our E-book). Philip Harringon, the main author of what was commonly called the “Green Book,” became the first chairman of the Chicago Transit Board. It should therefore be no surprise that the City of Chicago’s plans were carried over into the early days of the CTA. Chicago Surface Lines believed in the superiority of the streetcar for use on the busiest routes. 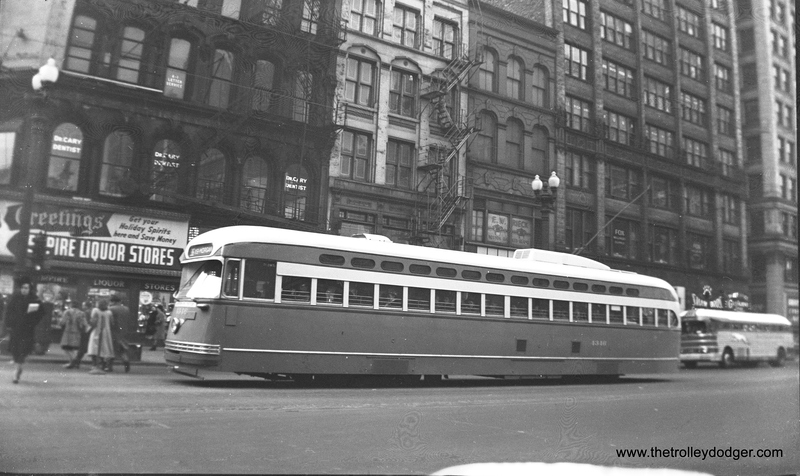 Following national trends, the Green Book plan of 1937 envisioned replacing about half of Chicago’s streetcars with buses. By the time CTA took over in 1947, this “busstitution” plan had increased to 75 or 80%. 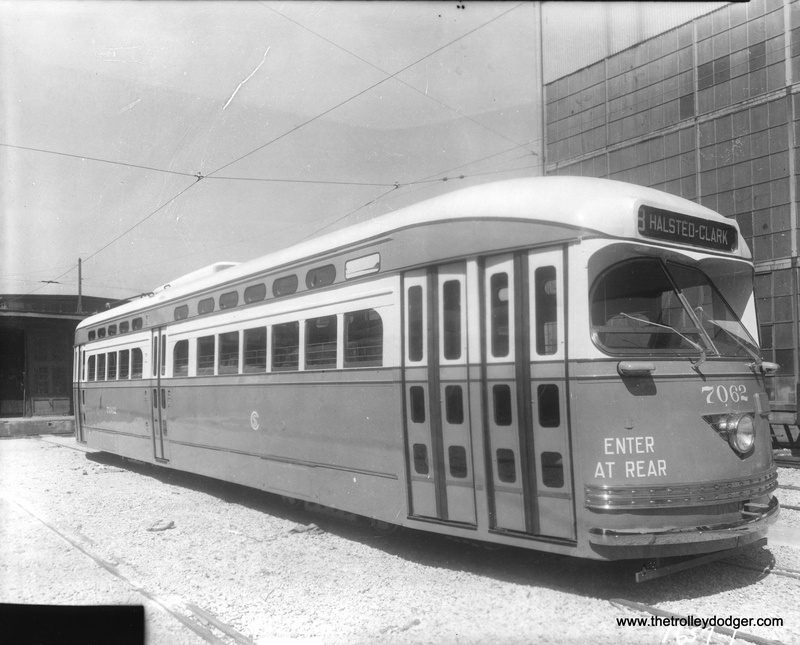 In 1945, CTA was all in favor of ordering 800 modern streetcars– 600 to start, and 200 more within a few years. Along with the 83 Prewar PCCs and the 100 Peter Witt “Sedans,” this would have given CTA a fleet of nearly 1000 modern cars. The City of Chicago had been very much involved in determining the specifications for the new postwar cars, which were finalized in 1941. Since CSL had a modernization fund available, the CTA had no difficulty persuading the bankruptcy courts, which were in control of CSL, to approve orders for new equipment. And even though CTA did not take official control until October 1, 1947, they were very much involved in deciding not only what was ordered, but where and when it would run once delivered. CTA felt it had been given a “mandate” by the State and the voters to make transit improvements as soon as possible. If not for World War II, there might have been a slower and more orderly transition to rubber tired vehicles. But with wartime shortages, orders for new buses were put on hold for four years. War’s end coincided with the creation of the CTA, and there was a pent-up need for change. But the winds of change in local transit circles changed very quickly. The street car is dead. With the exception of a few long haul, heavy traffic routes, street cars, which came in before paved streets, are obsolete. They should be replaced by buses. You can read the rest of this editorial in our post Chicago’s Postwar PCCs (June 9th). 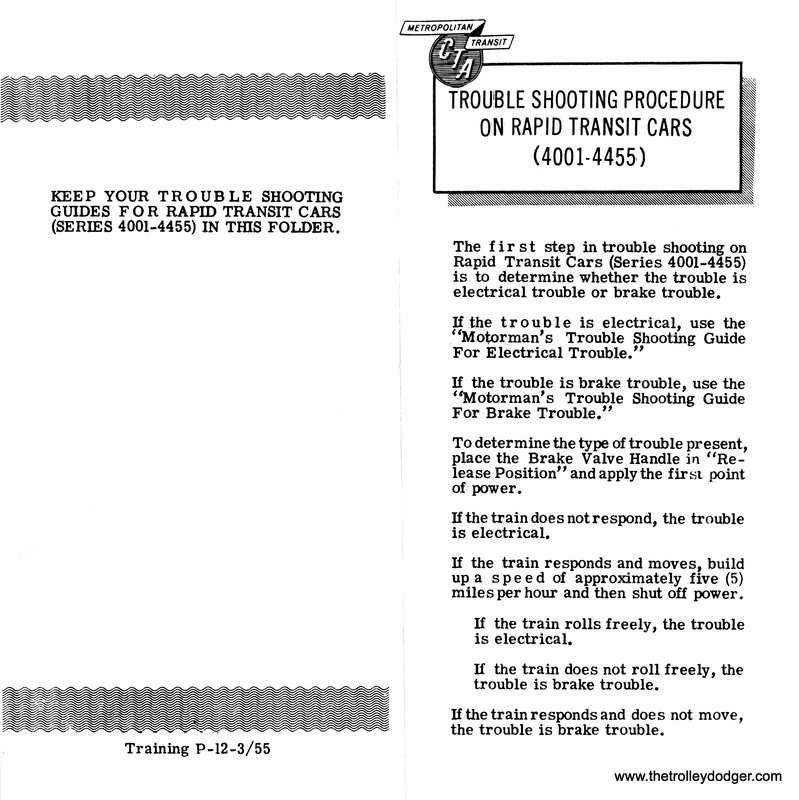 A year later, Walter J. McCarter, new General Manager of the CTA, reported that CTA had tried to cancel the remainder of the PCC order, but had been unsuccessful. Chances are this action could not have been taken prior to October 1, 1947. Until then, CTA would have needed to work through the courts and the Surface Lines. These issues, and many more, are covered in detail in our E-book, which can be read on any computer with Adobe Acrobat Reader installed. We will continue to improve Chicago’s PCC Streetcars: The Rest of the Story as new information becomes available. We are committed to making this the best book possible and a real (albeit unofficial) companion piece to Bulletin 146, which is itself a must-have for any railfan who is seriously interested in Chicago streetcars. *Bulletin 146 is available directly from CERA. Trolley Dodger Press is not affiliated with Central Electric Railfans’ Association. PS- We thank our readers for their continued support as The Trolley Dodger has reached another milestone, with more than 65,000 page views (from nearly 20,000 individuals) since our first post in January. 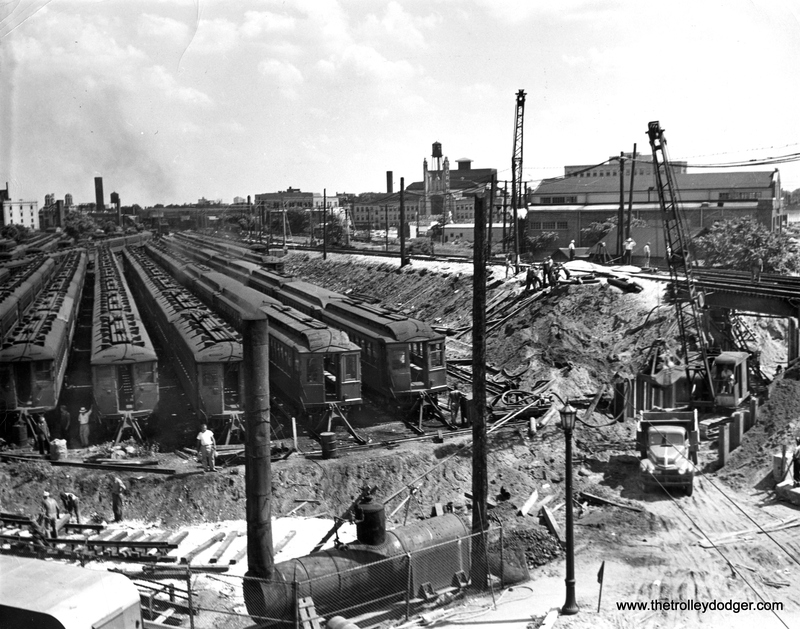 CTA 4282, a Pullman, passes the Congress expressway construction site on Halsted in 1952. In general, bridges were built first, and areas around them dug out afterwards. 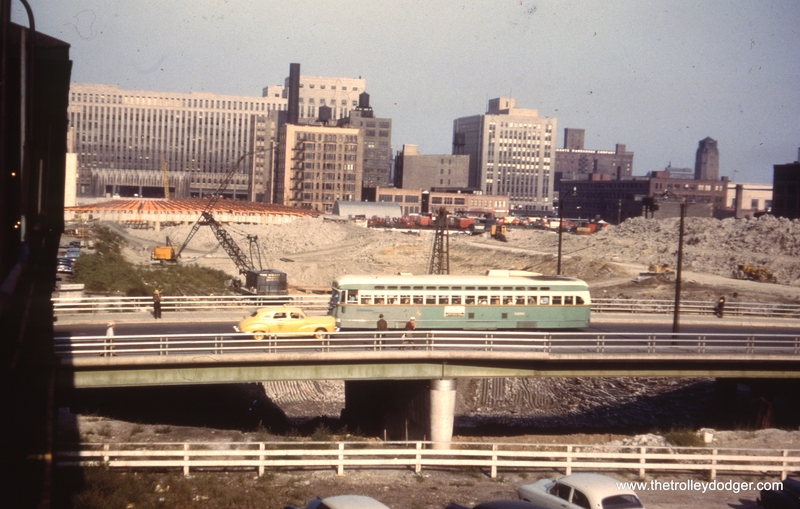 This section of highway opened in late 1955, by which time the streetcars had been replaced by buses. CTA Prewar PCC 4032 being shipped out from South Shops for scrapping. 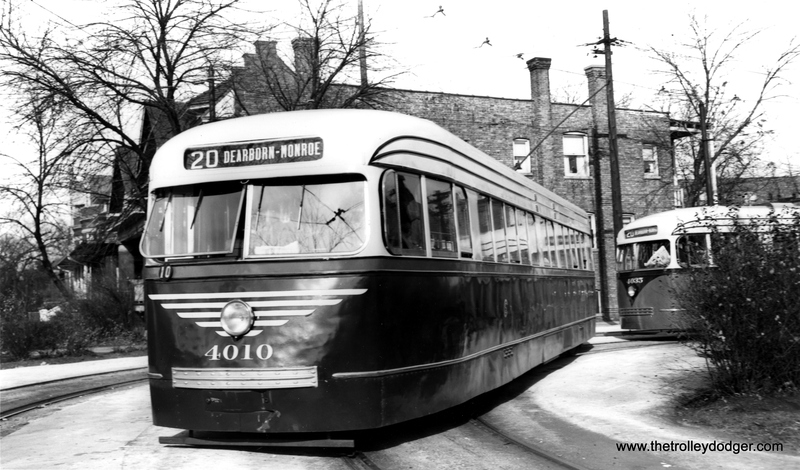 According to the list compiled by Andre Kristopans, the date is around August 13, 1956, about two months after streetcar service ended on route 49 Western. CTA 4346, built by Pullman-Standard, on route 36 Broadway-State. CTA 4406, a product of St. Louis Car Company, in charter service on Clark Street north of Cermak Road, October 21, 1956. 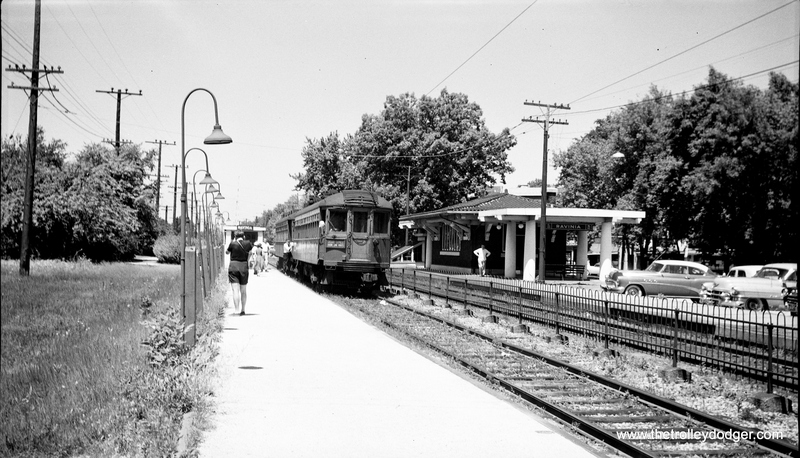 A two-car train of “flat door” 6000-series cars at the ground-level Oak Park Avenue station on the Garfield Park “L” in the 1950s. 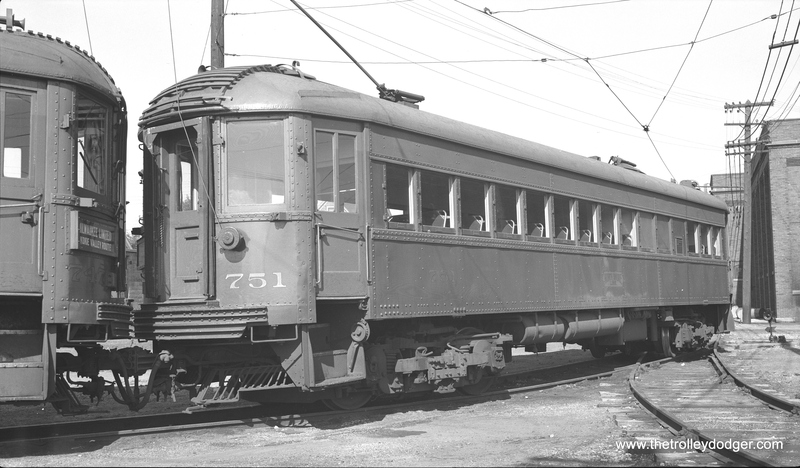 These used PCC technology and were built with all new parts, unlike the later curved door cars that were partly built with parts salvaged from PCC streetcars. The building at rear, located at approximately 814 Harrison Street, is still standing in Oak Park. The approximate location of the last picture as it looks today. The Forest Park branch of the CTA Blue Line is in the foreground. The old Garfield Park alignment, at ground level, would be about where the truck is in this picture. The building at 814 Harrison as it looks today. Closeup of CA&E wood car 309, now restored to operating condition at the Illinois Railway Museum. In library and information science, the term ephemera also describes the class of published single-sheet or single page documents which are meant to be thrown away after one use. Today’s post features some railfan ephemera, things that were designed for transitory use, that few people would have considered worth saving. We can be thankful that they were saved, since these items can sometimes tell us important things we would not know otherwise. There are several tidbits of information in the brochures and flyers we’re presenting today. 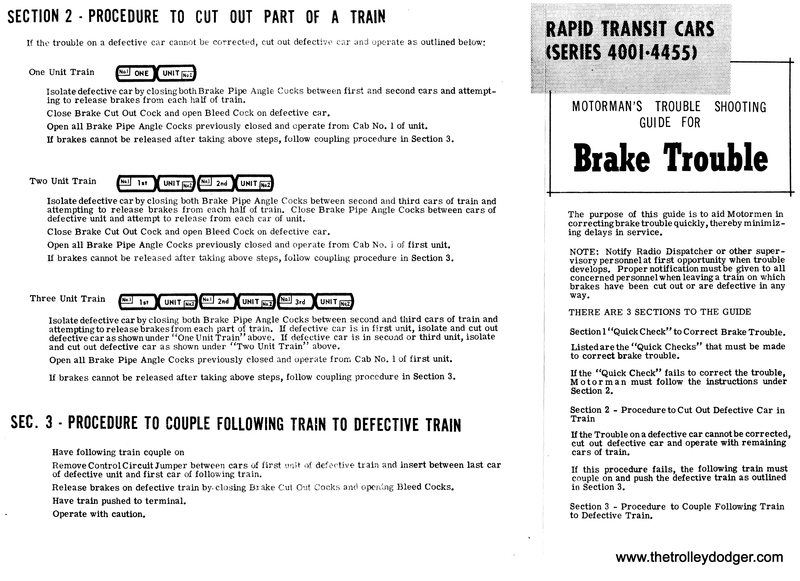 A CTA brochure from 1949 includes a very good statement of how that agency intended to speed up rapid transit service. 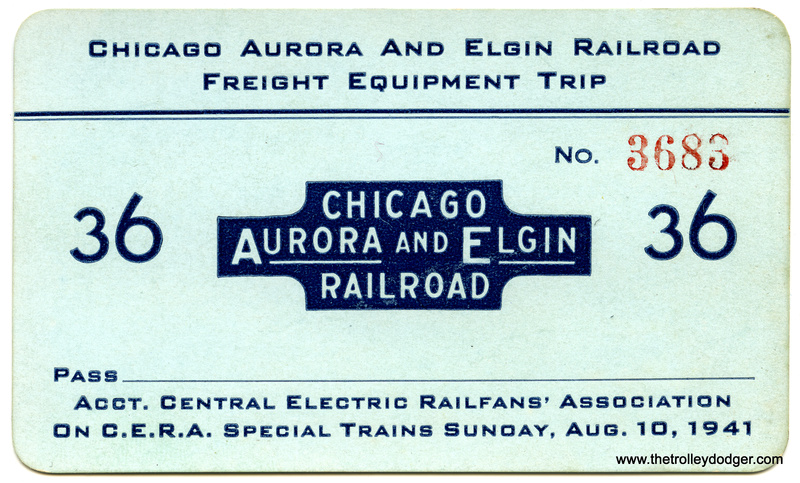 An early (1959) fundraising flyer from an early version of the Illinois Railway Museum calls CA&E car 309 the “jewel” of the Roarin’ Elgin’s fleet. This car was eventually purchased by the museum and, after surviving a later fire, restored back to operating condition. You can read the 309 story on the excellent Hicks Car Works blog here. We have several other CA&E-related items. 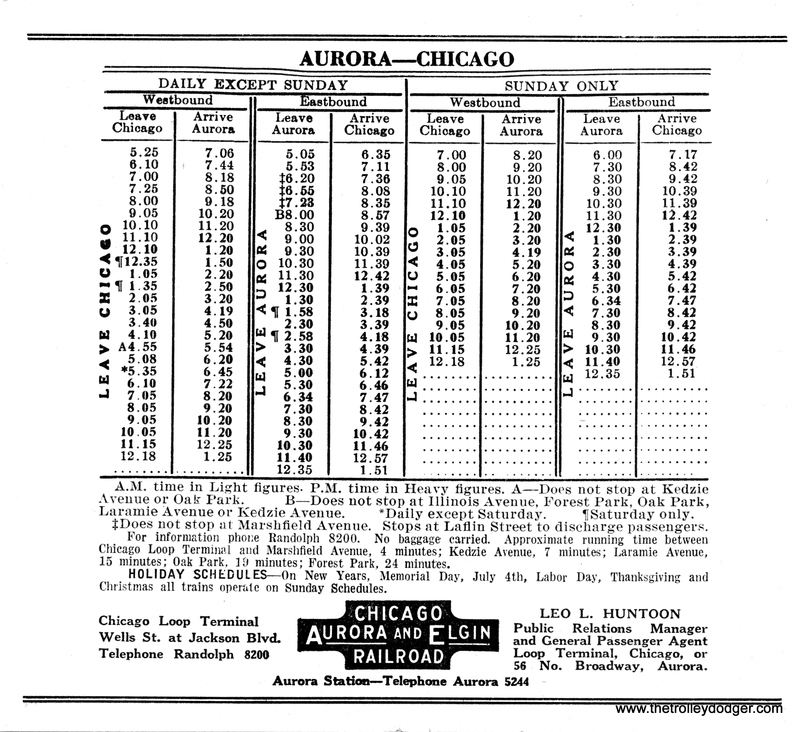 A timetable from late 1939 pinpoints the date when the Chicago, Aurora & Elgin interurban switched their route into Aurora from street trackage to a new private right-of-way along the Fox River. 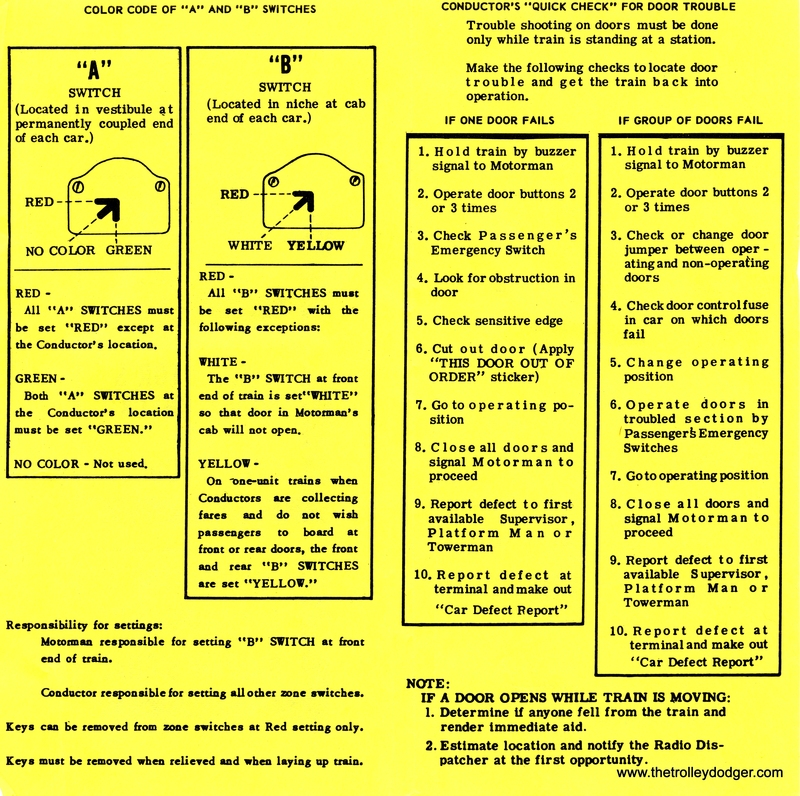 Finally, there are some vintage CTA flyers that describe how to troubleshoot various problems on the venerable 4000-series “L” cars that were, for so many years, a mainstay of the system before their retirement in 1973. Two cars from that fleet are still on the CTA property today and are occasionally run, as they were last year, when they celebrated the 50th anniversary of the Skokie Swift, today’s Yellow Line. 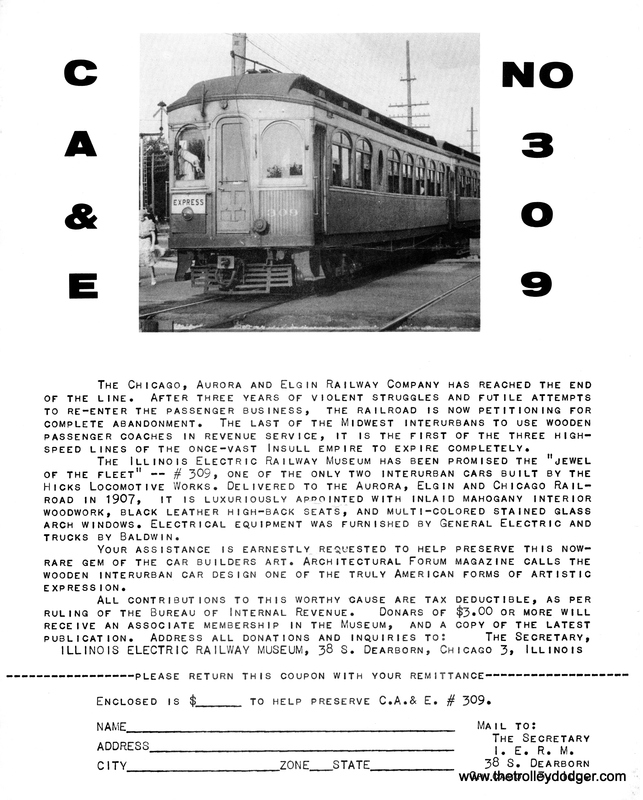 A flyer from the Illinois Electric Railway Museum, circa 1959, attempting to raise funds to save car 309, described as the “jewel” of the CA&E fleet. 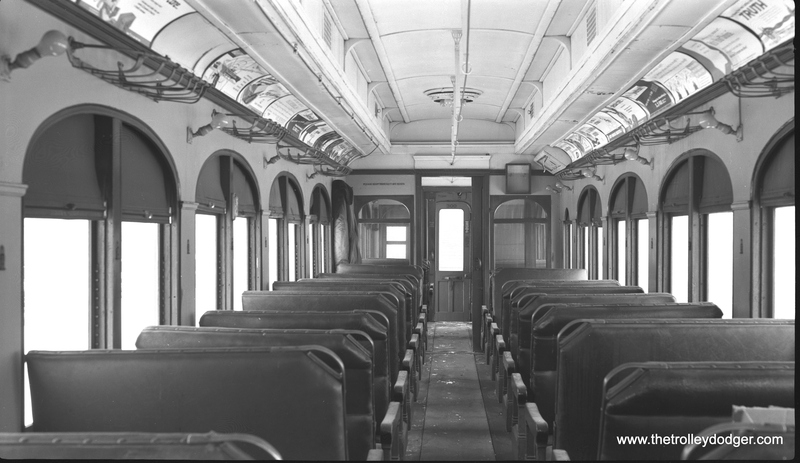 The interior of CA&E car 300, as it appeared on February 25, 1962, shortly before this car was scrapped. CA&E 36, built by John Stephenson in 1904. 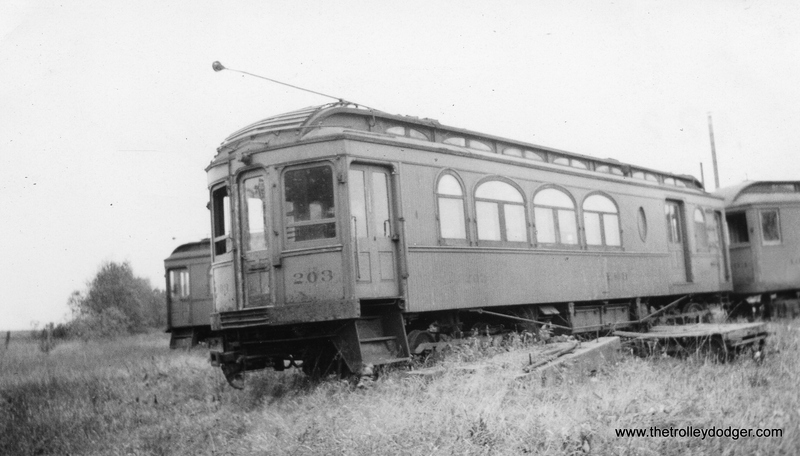 After the interurban’s demise, it was purchased by Trolleyville USA in Ohio. It came to the Illinois Railway Museum in 2009 where it remains in operating condition. 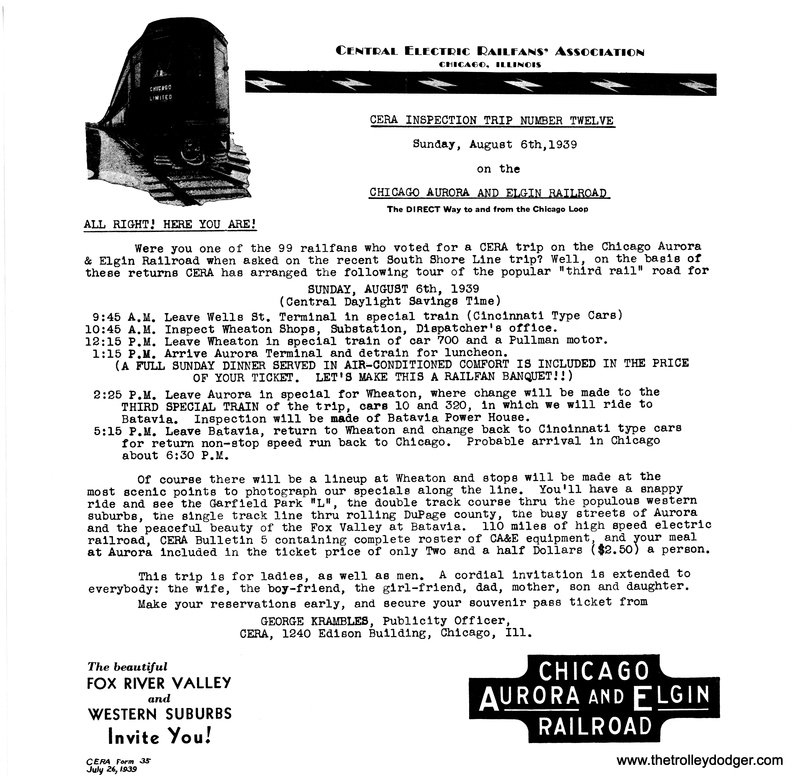 A flyer advertising a 1939 CA&E fantrip that included the street trackage in Aurora, shortly before this was eliminated. 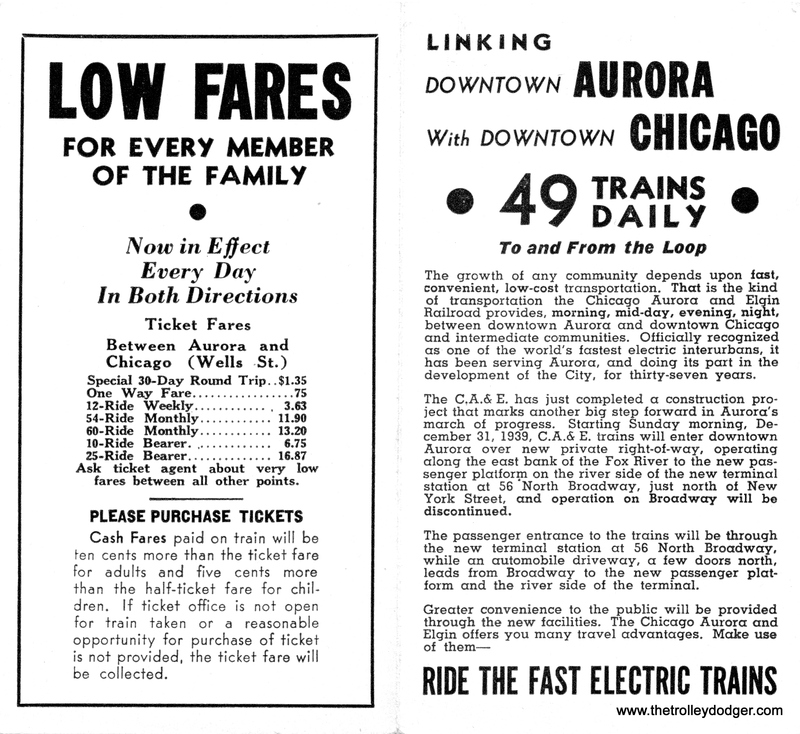 A CA&E timetable announcing a change in the right-of-way entering Aurora, effective December 31, 1939. A pass from an early CERA fantrip. 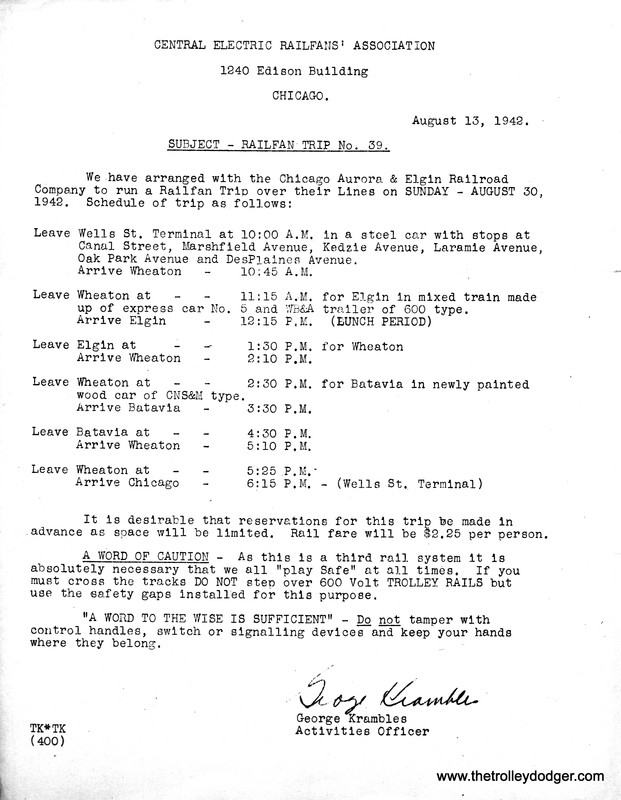 Itinerary for a 1942 fantrip on the Chicago, Aurora & Elgin. 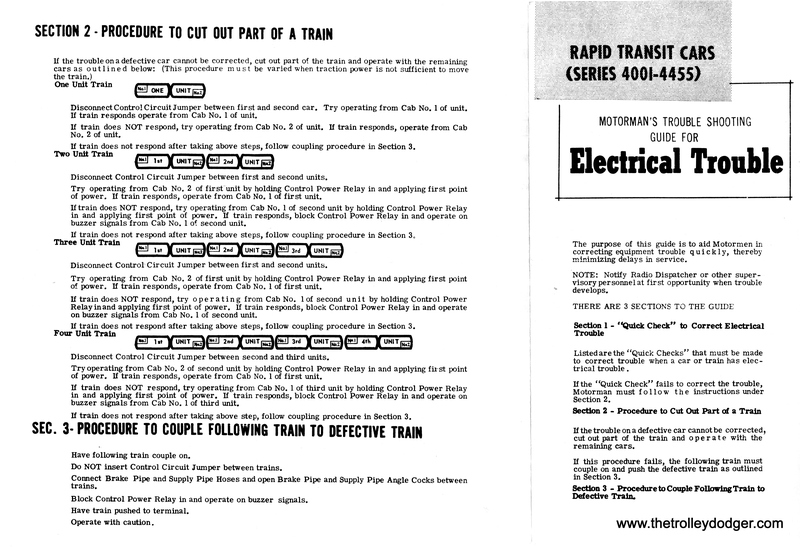 An advertising insert for the Electric Railway Pictorial (1945). 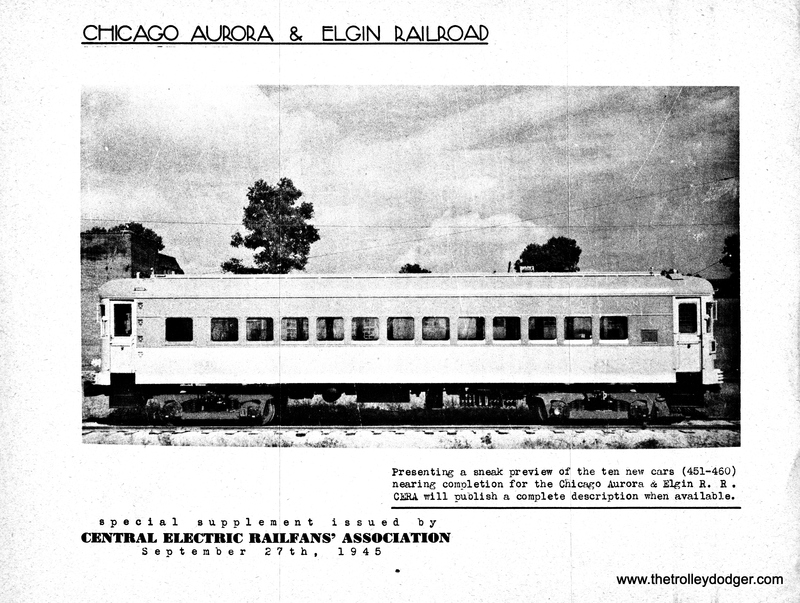 The advert for the Electric Railway Pictorial includes what is probably a builder’s photo from St. Louis Car Company, showing one of the curved-side CA&E cars delivered in 1945-46. Once A/B service proved successful on the Lake Street “L”, the CTA extended it to other routes. Those 4000s sure got around in their day. Here is a rare shot of Chicago Rapid Transit Company “L” car 4432 heading up a train in North Shore Line street running territory on Greenleaf Avenue in Wilmette. It was probably pressed into service hauling the military during World War II. 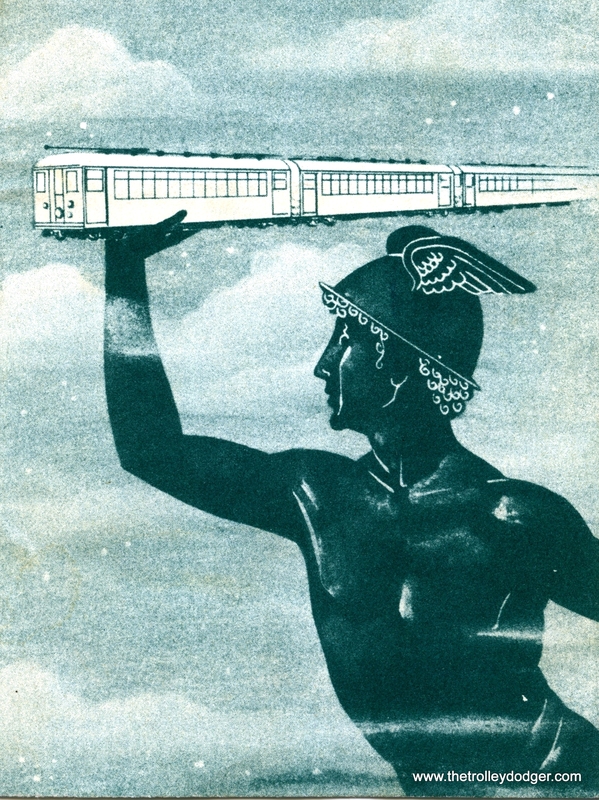 The illustration on the CTA brochure is patterned after the statue Flying Mercury by Giovanni da Bologna (1529-1608). 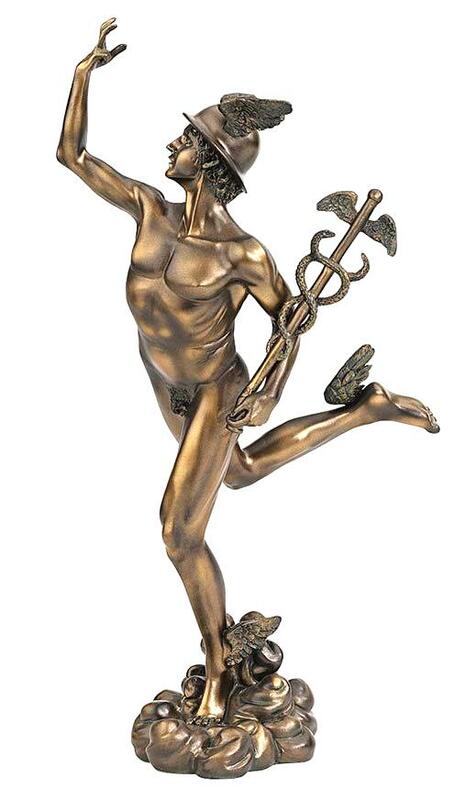 The messenger of the gods and patron of commerce and trading, winged Mercury speeds through the skies carrying the caduceus that symbolizes both immunity during war and the practice of medicine. Bologna, working in the Medici court in Florence in 1580, composed his subject in the figura serpentine that masterfully guides the eye. 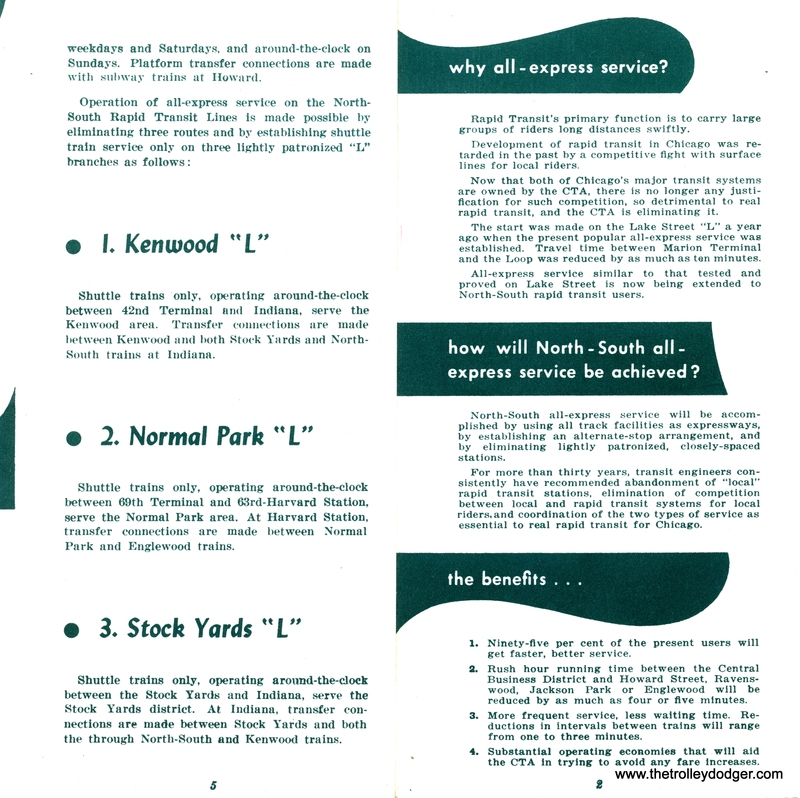 Closeup of a 1949 CTA brochure announcing the expansion of A/B “skip stop” service to North-South routes. Construction of a turning loop at Howard Yard, 1949-50. This photo was the subject of the correspondence that follows. The institution of A/B service led to other changes. 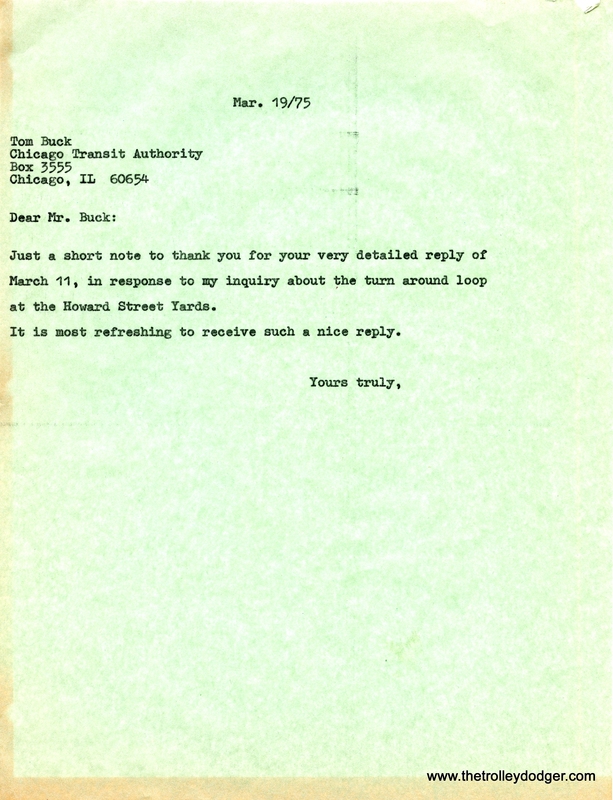 As the following correspondence shows, it impacted where CTA stored rapid transit trains. As the CTA’s Tom Buck pointed out, prior to this, trains terminated at various places along the North-South line, and service was overlapping. Once “Skip Stop” service began, there was a need for improved facilities at the ends of the line. Thus, a turning loop was installed at Howard Yard between 1949 and 1950, so that trains could be turned around quicker. Nowadays, the term “cc” (short for carbon copy) is widely used in e-mail. But there was a time when it had a more literal meaning. Back in the days when people corresponded via typewriters, if you wanted to keep a record of letters written, you would make a carbon copy. You would place a piece of blue carbon paper behind your stationary, and behind that, a very thin sheet. Here are two such carbon copies. These letters date from 1975, in the years before home computers, in the days when people still wrote actual letters to each other and mailed them. Before he worked at the CTA, Tom Buck (1917-2004) wrote about transit matters for the Chicago Tribune. Here are nearly two dozen classic North Shore Line images in glorious black-and-white, from some legendary railfan shutterbugs. We were lucky enough to track down the original negatives for all of today’s pictures, which even include a couple that measure 4×5 inches. The late C. Edward Hedstrom, Jr. (1918-2009) took the Shore Line photo (reproduced above) at Ravinia on the final day of service, July 24, 1955. He was employed by the South Shore Line, mainly as a motorman, from 1939 until he retired in 1983, following in his father’s footsteps. C. Edward Hedstrom Sr. worked there from 1921 to 1960, so their combined South Shore service covers 63 years. Chances are Mr. Hedstrom also took the other 1955 Shore Line photo we are featuring today, but it is not so marked. 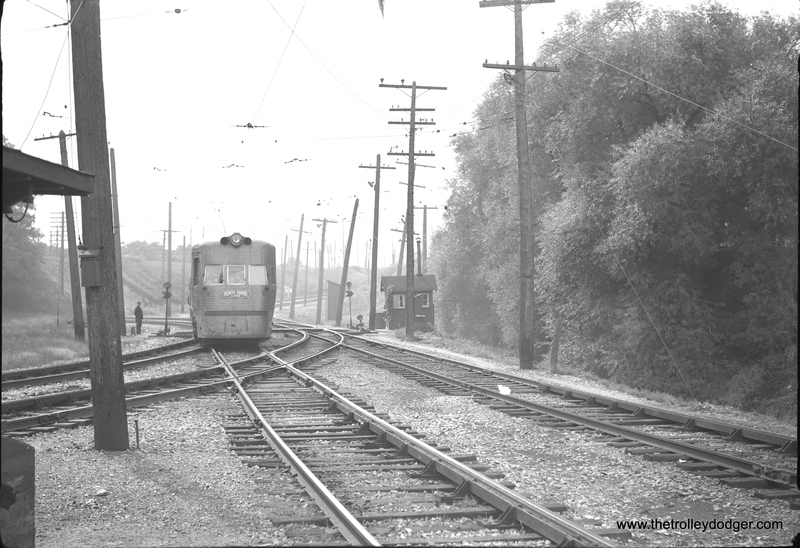 Today’s photos show how much variety there once was in North Shore Line operations, including the Shore Line as well as the Skokie Valley Route, the branch line between Mundelein and Lake Bluff, city streetcars (including Birneys), freight locos as well as merchandise dispatch. It was quite an operation. There is a trail now along much of the Shore Line Route, which has now been gone for 60 years. But the memories of this fine interurban railroad live on. PS- If you enjoy seeing these great images, check out the fine offerings in our Online Store. The proceeds help support the original research that our readers like. We need your help and support to continue this work in the future, for the benefit of all railfans, everywhere. 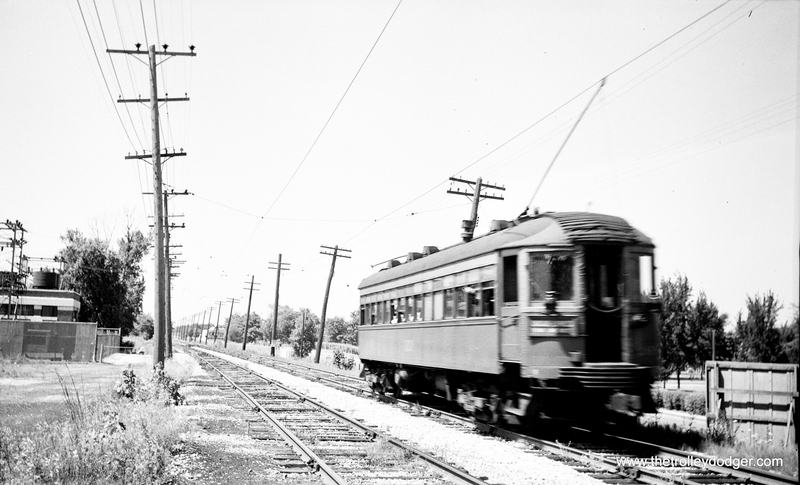 One of the two Electroliners at North Chicago Junction nortbound approaching Junction station. 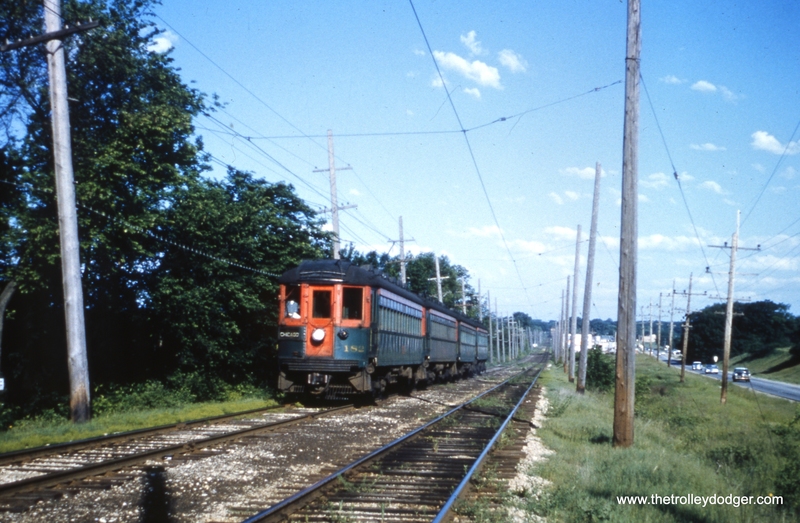 This picture was taken no later than 1955, as the Shore Line route via Sheridan Road to Waukegan is still present. 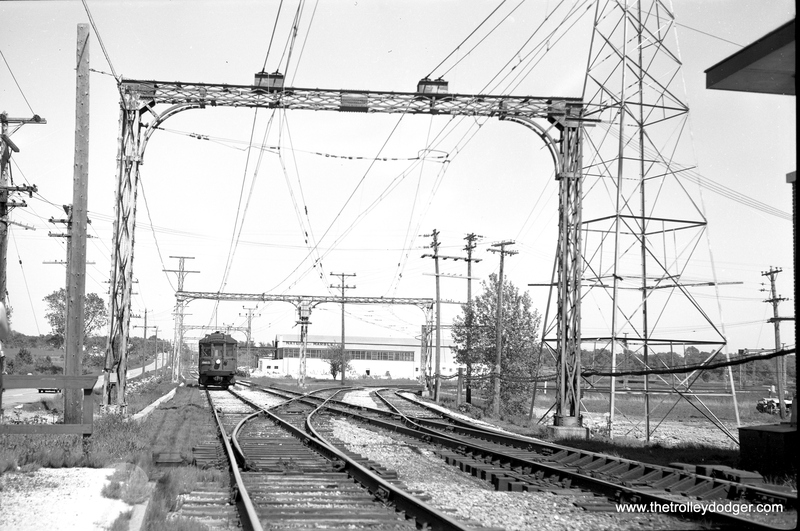 CNS&M 767 at Highwood on the Shore Line Route on April 29, 1940. A Birney “at speed” near the Harrison shops, probably in the late 1940s. CNS&M 760 and a Birney streetcar at Harrison shops in Milwaukee. Looks like the 760 is being cleaned. 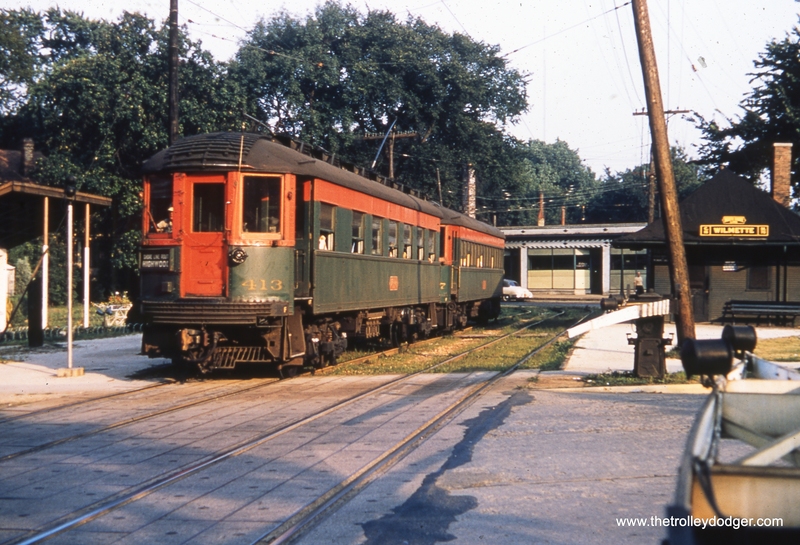 Car 168 at Fort Sheridan on the Shore Line Route on July 24, 1955, the last day of service. 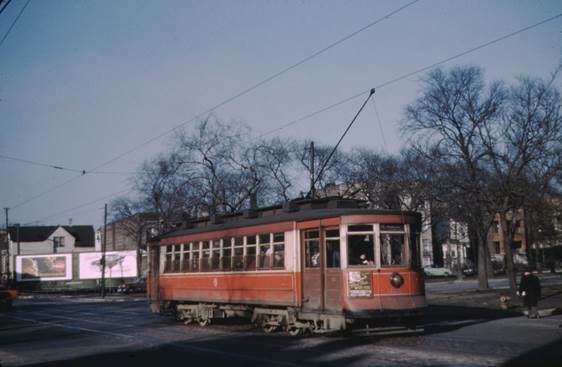 North Shore city streetcar 360 at 5th and Harrison in Milwaukee on May 12, 1949. 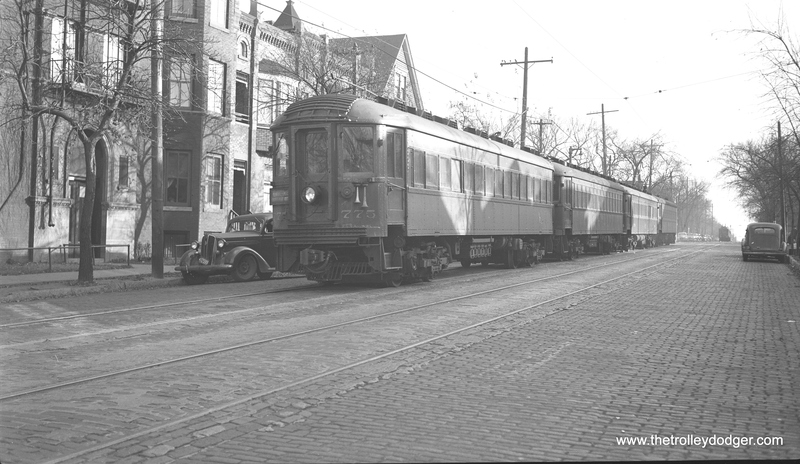 Cars 757 and 168 at 5th and Harrison in Milwaukee on May 12, 1949. 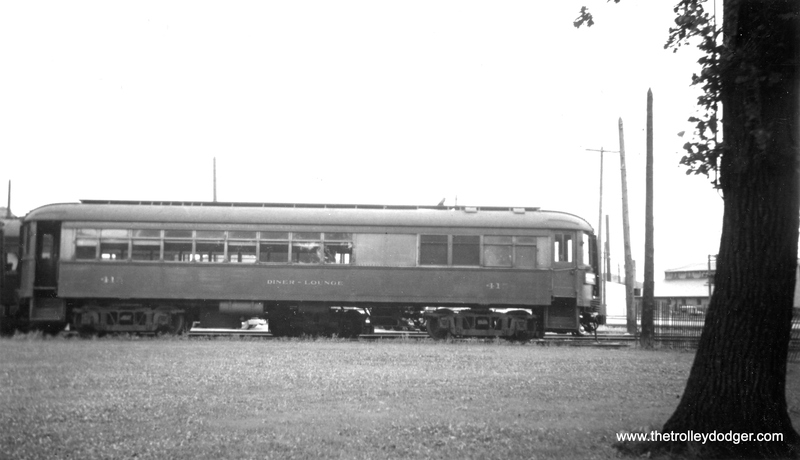 Car 757, built by Standard Steel Car Company in 1930, is preserved at the Illinois Railway Museum. 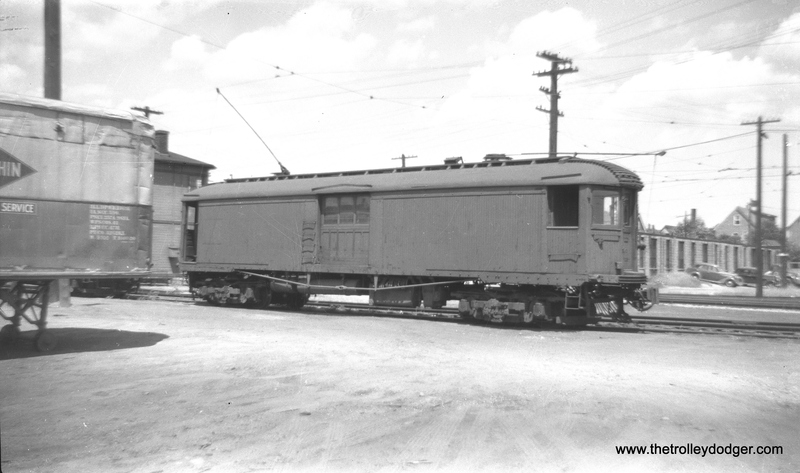 Merchandise dispatch car 228 at Harrison Street, Milwaukee, on July 17, 1947. This car is now preserved at the East Troy Electric Railroad in Wisconsin. CNS&M 168 heads up a three-car Chicago Local on the Shore Line Route, stopping at Linden Avenue in Wilmette. The date is February 11, 1939 and we are looking north. The same location today. Not sure if the building at left incorporates any of the old building seen in the 1939 picture. 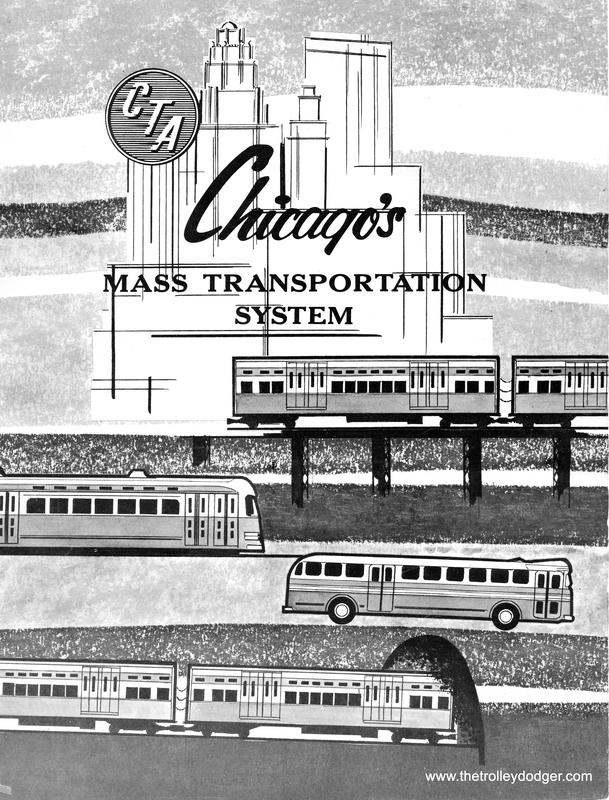 The cover of the 1957 version of Chicago’s Mass Transportation System, which is included as a Bonus Feature of our E-book. Andre Kristopans is well-known in railfan circles as one of the most knowledgeable transit historians in the United States, certainly the foremost concerning buses used here in Chicago. 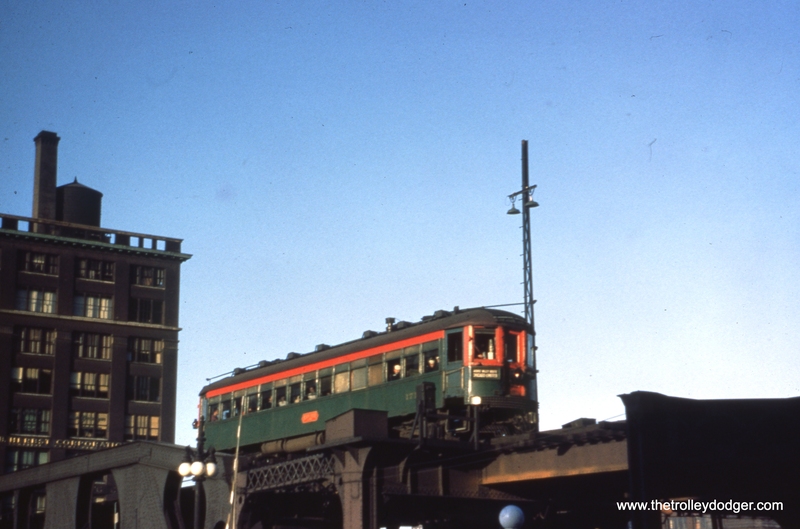 He recently shared a complete list of Chicago PCC delivery dates and scrapping dates with The Trolley Dodger, which we added to our e-book Chicago’s PCC Streetcars: The Rest of the Story, available through our Online Store. One advantage an electronic book has over a printed one is that it can be improved upon. We have always intended that to be the case with Chicago’s PCC Streetcars: The Rest of the Story. If you have already purchased a copy of this e-book, and wish to get the most updated version, we can send you a link so that you can download it at no additional charge via Dropbox. Dropbox is a free service that allows people to transfer large files via the Internet. The book is about an 850mb download. Even better, as further improvements are made the updated files can be automatically downloaded onto your computer via Dropbox if you wish. Besides the list of delivery and scrapping dates, we have also added about 25 more photos to the book since it was first published, plus a system map for the Chicago Motor Coach Company. We have additional updates planned for the future, and want to make sure that whenever you purchase your copy, you will be assured of having access to these updates as they become available. Sales of this and our other fine products help support the original research we feature here on The Trolley Dodger blog. You can also make a donation via our Online Store. All the images used in this post are recent additions to our E-book. The cover illustration from a Surface Lines brochure printed in August 1947. DS: Were the cars that had fareboxes installed the same ones that were converted to one man, or did some two-man cars also get some? AK: All cars that were going to be around for a while got at least the pedestals for fareboxes installed. One thing I am not certain of is when CTA decided to get rid of the fare registers and replace them with (used) J-boxes. I know the buses all got fareboxes around this time, but I don’t know if, or when, the 2-man PCC’s did. Would have been by conductor’s station. DS: What is a J-box? AK: J-boxes were the 1940’s fareboxes that were only able to take quarters and tokens. 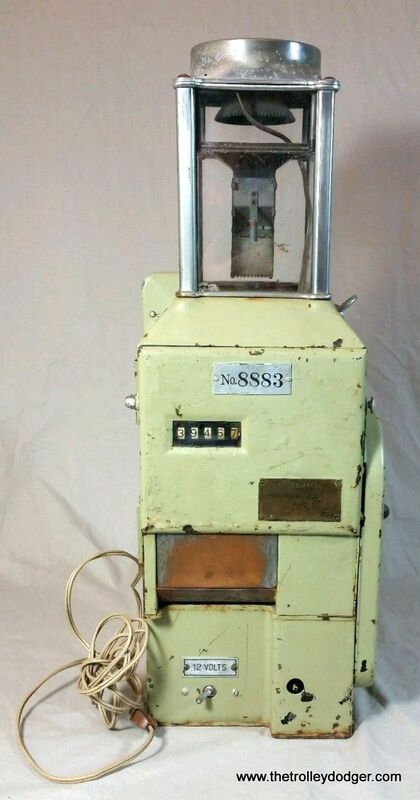 Made by Johnson Farebox as model J, they actually showed up at CTA in around 1950 as they were bought second-hand from somewhere unknown (and later sold off after CTA went to exact fare in 1969!). The more modern ones from the 1960’s that were bigger and took all types of coins were Johnson type K’s. Johnson later became Keene Farebox. I believe the renumberings were caused by CTA having entered into contracts with St. Louis Car Company that specified certain car numbers for shipment as part of the so-called “conversion program.” Then, for whatever reasons, CTA wanted to send a different car instead of one that was specified, so they took another one and renumbered it to fit the sequence of cars being shipped. AK: Exactly. CTA had no official record of any renumberings. What it was loaded on the flatcar with was how it was entered on the property card. DS: Later on, I think the contract wording was changed in later orders so that CTA was allowed to substitute. AK: The numbers are very specific in the AFR’s – these cars under this AFR*. DS: We already know what the renumberings were. Roy Benedict had the information, which had been compiled by the late James J. Buckley. Most of the cars were renumbered in 1956-57, but there were also a couple in 1954. So there would be a “first” 7210 and a “second” 7210, etc. etc., and I would expect that the information on your list of scrappings would somehow correlate with the renumbering list. AK: Remember though as far as property accounting department was concerned, this NEVER HAPPENED! This was done by S&E** at South Shops on an ad-hoc basis, with downtown never being the wiser! 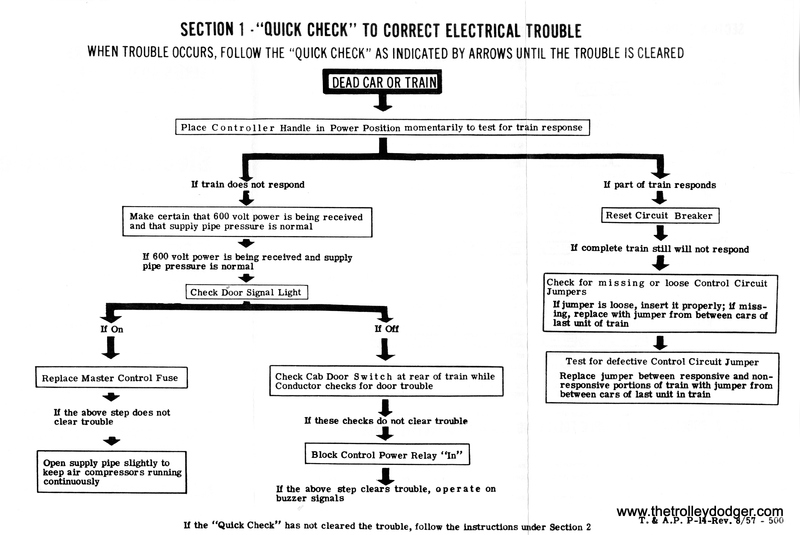 Some railroads were notorious for this, Milwaukee Road being probably the worst offender, as when HQ sent a work order to shops to “scrap 800 and 801”, shops would find two dead ones, renumber them 800 and 801, renumber the “real” 800 and 801 to the numbers they picked out, and sent a notice back to HQ “800, 801 scrapped”. Now where it got really funny was when they picked two replacements that were of a different though similar model, and the “rescued” ones stuck around for years to railfans’ delight! DS: If as I recall the later contracts with St. Louis Car Co. were revised to allow for substitutions of different cars, this would mean somebody was aware of the renumberings. I think I read this when I studied the Chicago Transit Board minutes from the 1950s. AK: Maybe, but nothing was ever recorded on the property cards, which I copied. 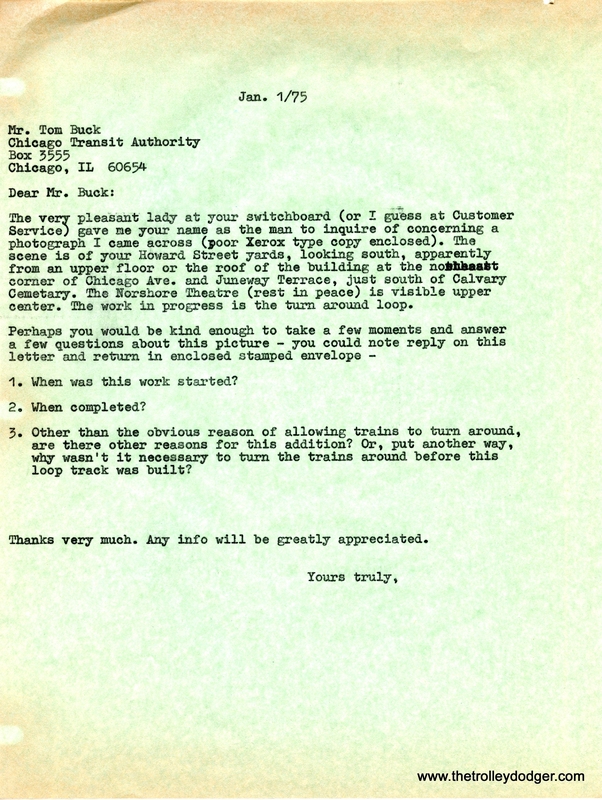 DS: Interesting that car 7213, the last car to run, actually was shipped off to St. Louis as part of the contract that built the 1-50 cars, while the other 25 cars that were still on the property simply were sold for scrap. It is also interesting that the 4391, the one postwar car that was saved, was designated for scrapping along with one other car, while an additional 20 were scrapped as part of a later order. AK: Bus scrapping is an even more convoluted matter – why a vehicle goes on a specific AFR is sometimes hard to understand. I suspect 4391 was retired “early” because it had some sort of failure. Not necessarily anything major at that point, but something happened to it. When IRM restored it to operation, they probably had to fix more than a few problems, and one of them was likely the reason car was retired. DS: Is it possible that CTA held off on selling the final 20 until they were certain that there was no chance that CTA would get control of part of the CA&E? 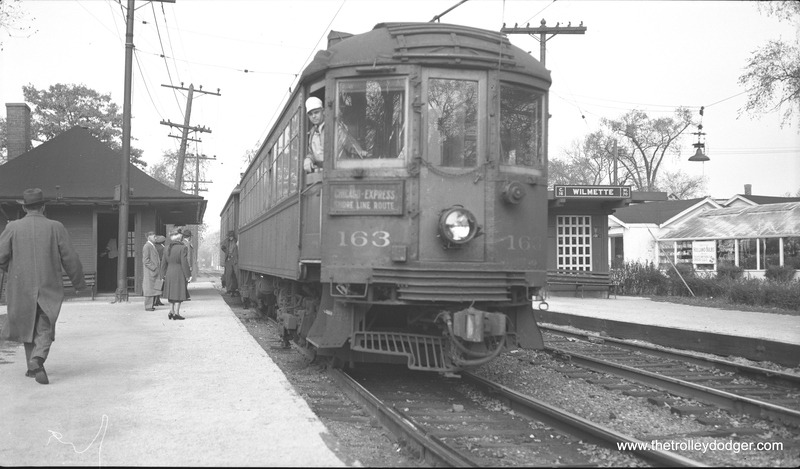 I know there was a 1956 plan where service would have been temporarily operated between Forest Park and Wheaton using some prewar PCCs, with construction of a turning loop in Wheaton. AK: That was one really sad episode. CTA was willing, CA&E was willing, but not without subsidy, and the towns along the line could not agree on who would pay how much. The off-line town like Addison refused to pay anything, but online towns said residents of off-line towns used the line too, so those towns should pay too. So in the end nothing happened. DS: CTA’s efforts to operate a portion of CA&E continued through 1959. The idea was to use PCCs for about 18 months, which would have bought the CTA time to order new rapid transit cars that presumably would have been able to operate downtown over the new Congress rapid transit line. I assume these cars would have been versions of the 1-50 single car units, with possibly more plush seats and high-speed motors. AK: Most likely not “high speed” as CTA would have most likely run all-stops, with a stop every mile or so. Basically would have been just another “L” route. DS: CTA spent several years working with various manufacturers to test and develop high-speed trucks. It seems that construction of the Congress rapid transit line led to a lot of interest, among the public and various officials, in having rapid transit cars that could go as fast as the autos on an expressway. 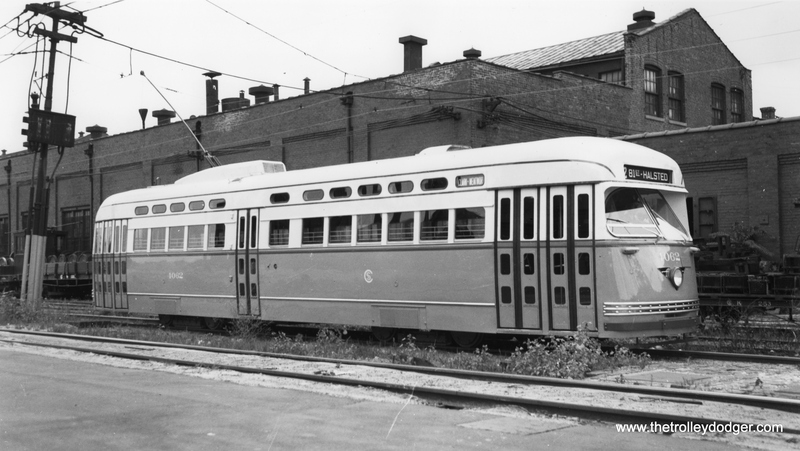 CTA held a public hearing in the early part of 1958 in conjunction with the purchase of the final 100 cars in the PCC conversion program, and the only negative comments were that these were not going to be high-speed cars. CTA officials pointed out that high-speed cars would only provide a small amount of time savings over regular cars, and that they did not want to waste the perfectly good motors being salvaged from 100 PCC streetcars. 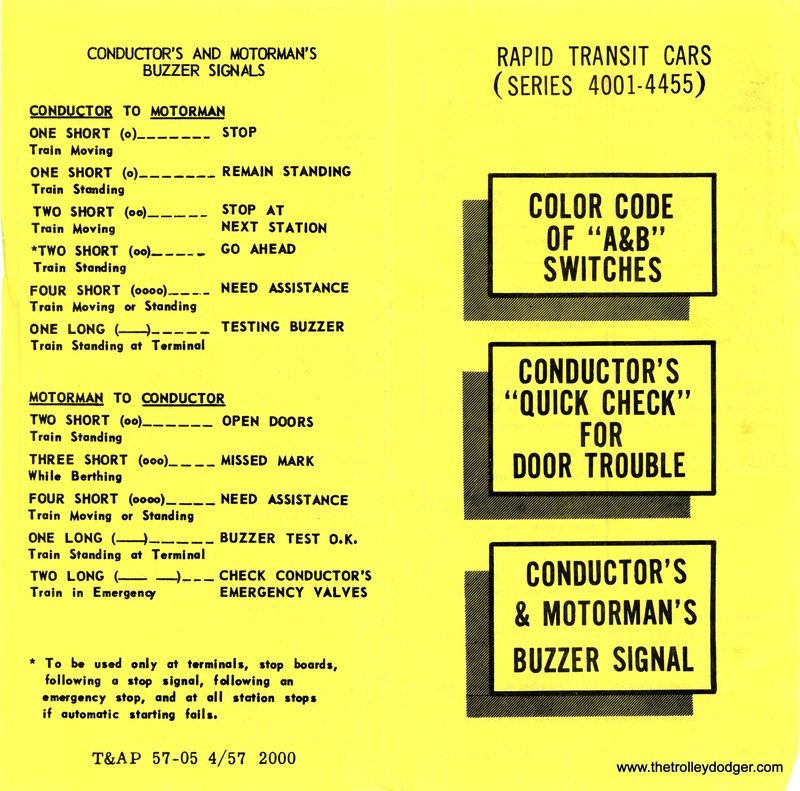 CTA’s experiments with high-speed motors continued after this and eventually resulted in the 2000-series cars delivered in 1964. 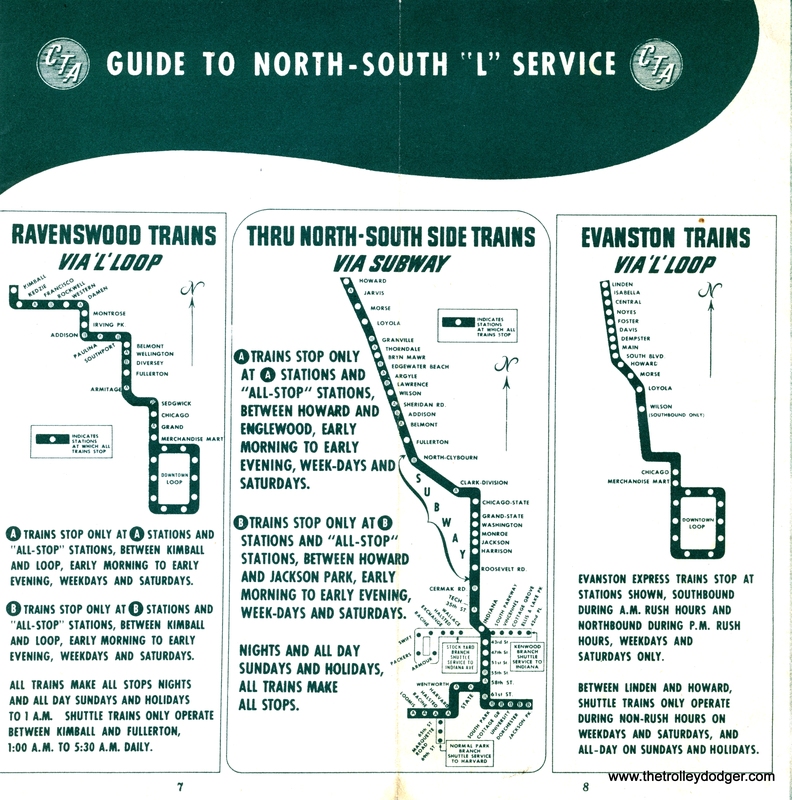 If CTA had been able to extend service over a larger portion of the abandoned North Shore Line, they would have ordered more cars, high-speed versions of the single car units, pretty much the same as the 1-4 cars used to provide initial service on the Skokie Swift. I guess the high-speed motors weren’t really perfected yet when CTA might have taken over portions of the CA&E. Simply extending service west of Forest Park using existing equipment would have been the simplest and made the most sense. Not sure why CTA felt it necessary to propose operating it as a feeder operation using PCCs. The Pullmans came with B-3 trucks and GE motors and St Louises with B-2’s and WH motors. Before they were shipped to SLCC the Pullmans and St Louis swapped trucks and motors as the B-3’s were considered less suitable for high speed operation. However, only 288 B-2’s were actually used, as 6489-6490 which should have had B-2’s came with B-3’s. Later, of course, B-3’s were indeed used under 6491-6720 and 5-50, though it is true that these cars did indeed vibrate more at higher speeds, such as on the O’Hare Extension. 4062-4101 (40) swapped with 4052-4061, 7035-7044 (20), with last 20 going with original trucks/motors as trades on 6491-6510. Now where the two extra sets of GE motors for 6489-6490 came from is a good question, possibly spares. 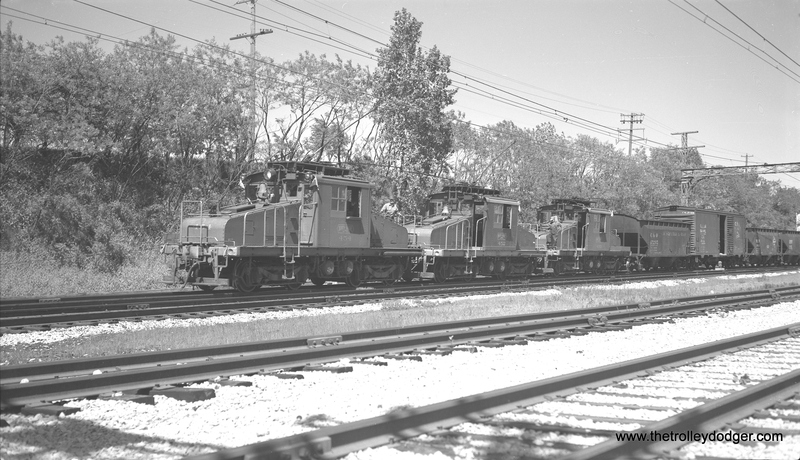 Later “L” cars, 6511-6720 and 1-50 came with B-3’s and GE’s, except of course 1-4, of which 1-2 were GE, 3-4 were WH. Also, for a while 6483-6488 had GE motors, too, swapped with 23-26, 29-30 when they went into Skokie Swift service. It says that there were 18 cars that were in operable condition at the end of service, which CTA put out for bid, and two cars that were not in operating condition, which were a separate bid. You could bid on them as a whole lot or otherwise. That would seem to imply that 4391 was one of the two cars that were inoperable. Maybe the narrative about the 18 cars really should read 20 cars, to match your list. AK: I do believe so! DS: However, according to CERA B-146, car 4391 was operated on the last day, as the third-to last car in service. AK: Just because a car ran on the last day does not mean the motorman didn’t put in a defect ticket after pulling in. DS: According to the narrative, the ERHS crowd wanted to buy 4391 from the scrap dealer, who had failed in his attempt to sell the cars to Mexico City. His next idea was to scrap the cars and sell components to Belgium. CTA still had some damaged cars that it needed to sell, and so the ERHS people bought 7218 and swapped it for the 4391. The 7218 appears on your list but with a somewhat higher work order than the final batch of PCCs operated on Wentworth. Did the CTA change their numbering sequence for these work orders at some point? AK: Yes – after the AFR’s in the 19000’s, they went back to 10000’s. DS: You had also at one point mentioned that you heard that part of the 7078 body (damaged in a May 25, 1950 crash with a gasoline truck, the so-called “Green Hornet Streetcar Disaster” of the book by the same name) was actually used to put another car together that was seriously damaged. Any idea which car this might have been? AK: The one that wrapped itself around the safety island at State/Root (the number escapes me at the moment). Probably correct, in that 7078 basically burned above the floor line and the frame appears to have survived relatively intact. Also, in that era (and really much later, into the 1980’s) repairs were done locally and if things didn’t come out exactly “as new”, that was not a problem. For instance, there was a Gary Transit fishbowl that got into a major wreck of some sort in the late 70’s and when they fixed it (themselves), they couldn’t quite get the left side of the body straight, so it had a definite “dip” in the sliversiding near the back door. But nobody seemed to mind. 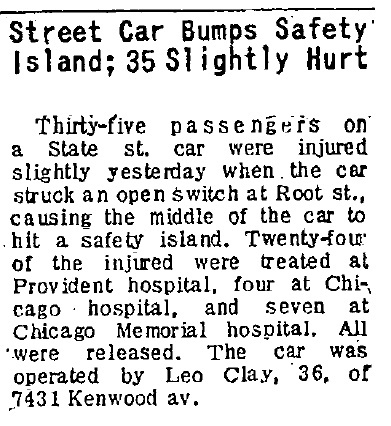 On July 18, 1949, the Chicago Tribune reported on the accident where CTA PCC 7205 was damaged. It was later apparently repaired using part of the body from car 7078, from a disastrous crash the following year, where 33 people were killed. Another thing that I discovered, while perusing the Chicago Transit Board minutes, is how much information they contained early in the CTA era, and how little was included later on. Early in the CTA’s history, it seems as though the Chicago City Council was voting to approve each and every bus substitution on a streetcar line, but later on, the CTA was acting pretty much on its own regarding a lot of these decisions. In 1952, as I recall, there was a local judge who said that CTA, having been created by act of legislature and a referendum of voters, was pretty much a law unto itself as regards what type of service to offer the public, and how much. 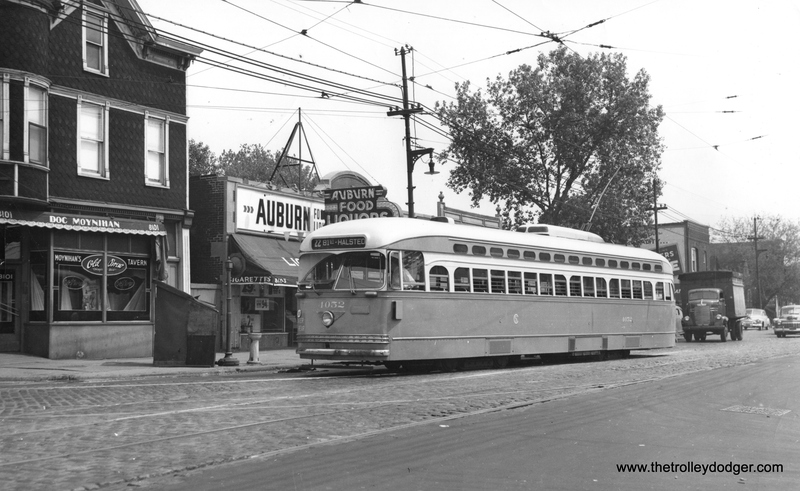 So, if they wanted people to ride the North Avenue trolley bus, instead of the Humboldt Park “L”, the public had no recourse through the courts. So when CTA decided in 1955 to end the Broadway-State through-route and substitute buses on southern half, the City seemed to be caught somewhat by surprise. Newspapers reported that the City had not been given time to study the matter. CTA said they were going ahead with it anyway because the new employee “pick” had already been made. When they did the same thing to Clark-Wentworth in 1957, apparently there was no public outcry. Despite the fear in 1955 that this might inconvenience 5000 riders, who in theory took advantage of the through-route, the 1957 change was done with very little fanfare. And when CTA approved the conversion of Wentworth to bus, this was done about two weeks before it took effect. AK: This was one of the big deals that was highly touted when CTA was formed – that it was not beholden to the state or the city but could do pretty much as it pleased. 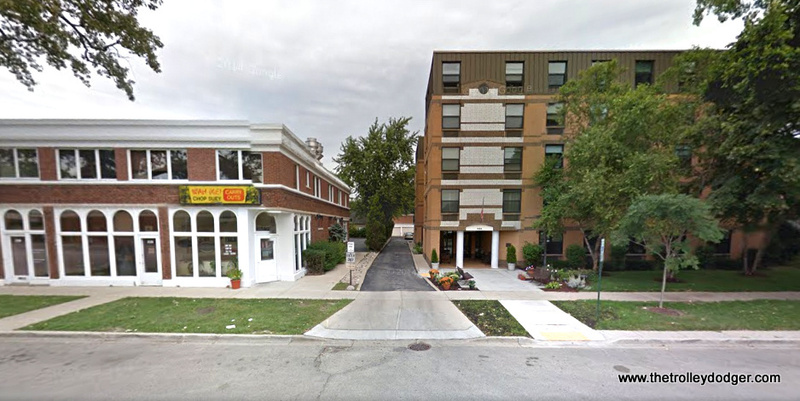 In the early days, CTA went to the trouble of asking the city’s “acquiescence” on conversions, as it did after involve streets and who was obligated to maintain and plow them. However, at some point around 1950 or 1951 amid the mass abandonments, CTA got the city to agree to a mass takeover of responsibility for maintenance, so CTA no longer felt obligated to ask for city “approvals”. By 1955, the system was pretty well stabilized, and there was little talk of protesting changes, because there weren’t many. DS: One of the cost savings claimed from substituting buses for streetcars came about by convincing the State legislature to exempt CTA from having to pay fuel taxes. They were unsuccessful in obtaining a subsidy, but they were able to do this much. **Shops & Equipment – the official name of the Shops Department. CTA 4399 heads south at Clark and Roosevelt on July 16, 1957. 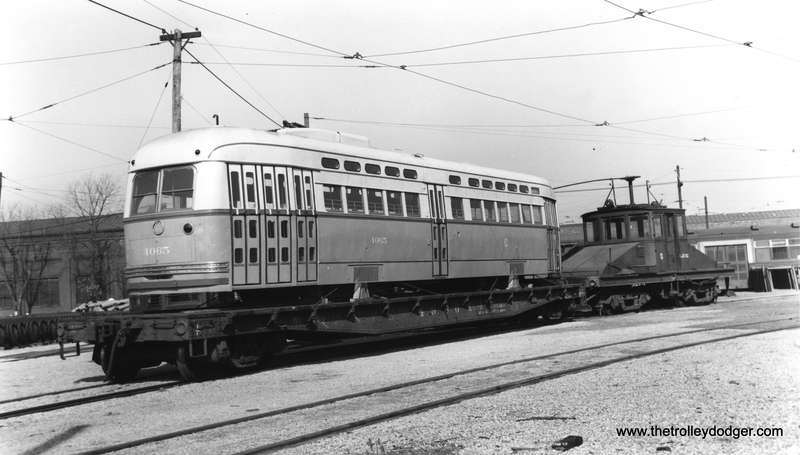 CSL 4062, the first postwar Chicago PCC, shown at South Shops shortly after delivery from Pullman, probably in September 1946. It is signed for Clark-Wentworth, the first route where the new cars were assigned. 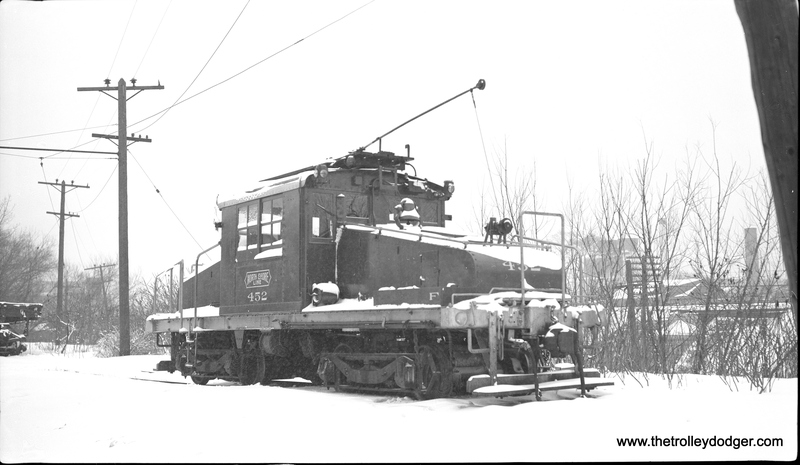 CSL 4040 at the Madison-Austin Loop on December 15, 1942. CSL 4004 at the west end of route 20 on May 15, 1940. CSL 7062 at St. Louis Car Company in a builder’s photo prior to shipment to Chicago, most likely in April 1947. 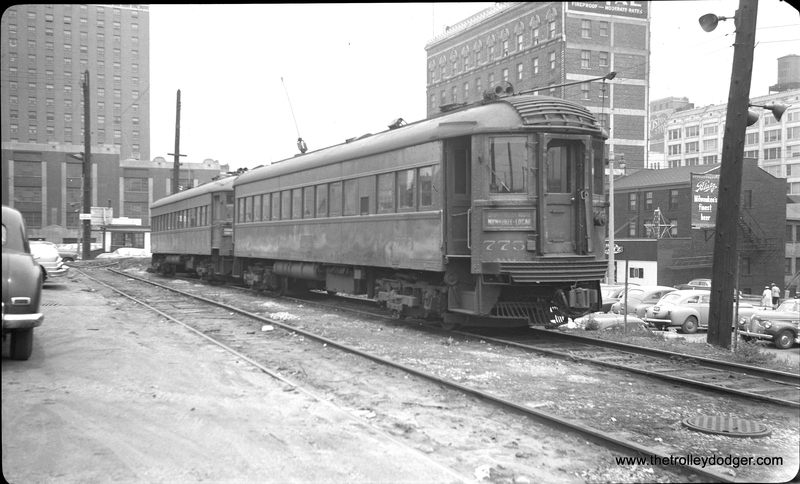 Andre’s list gives a scrap date of December 16, 1955, when this car was sent back to SLCC as part of the “PCC conversion program” for “L” cars 6471-6550. 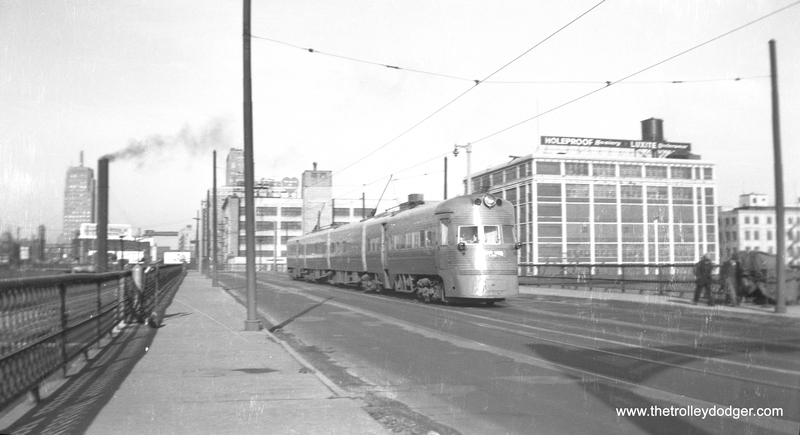 Postwar Chicago PCC 4065 being delivered to South Shops by CSL locomotive S-202 in late 1946. 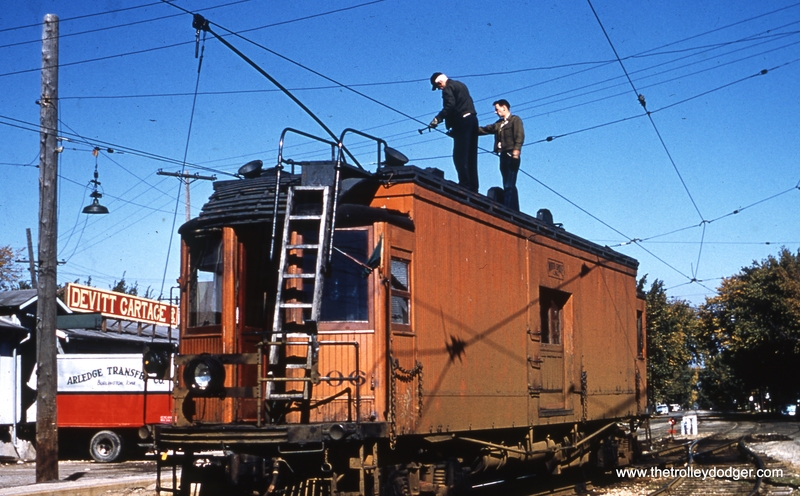 CSL 4010 in experimental colors in April 1946. This car is turning out of the loop at Madison and Austin to head east. 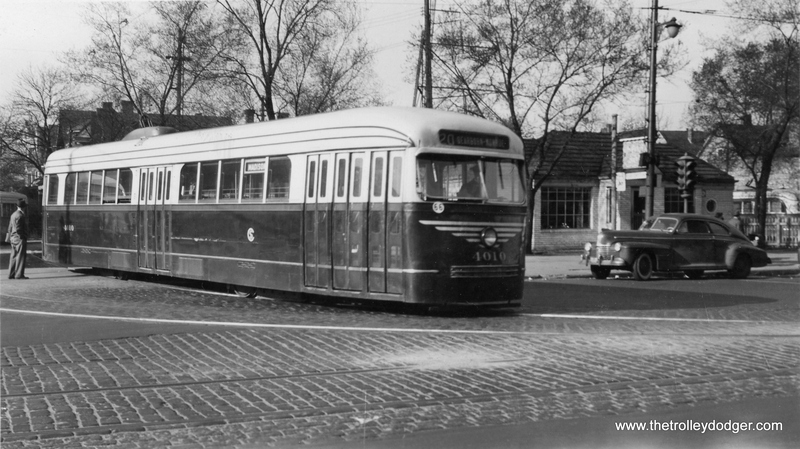 CSL 4052 at 81st and Halsted, the south end of route 22 Clark-Wentworth, most likely in 1947. 81st and Halsted today. We are looking to the southeast. 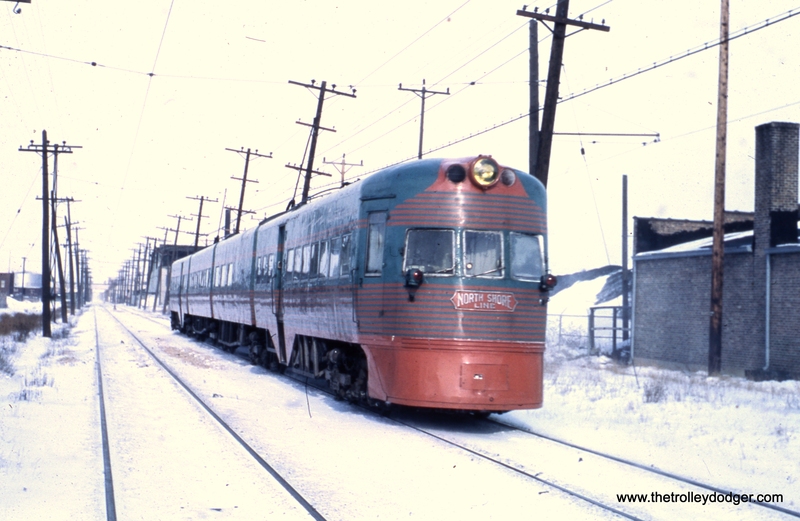 Electroliner set 803-804 departs Kenosha in January 1963, shortly before the end of service. 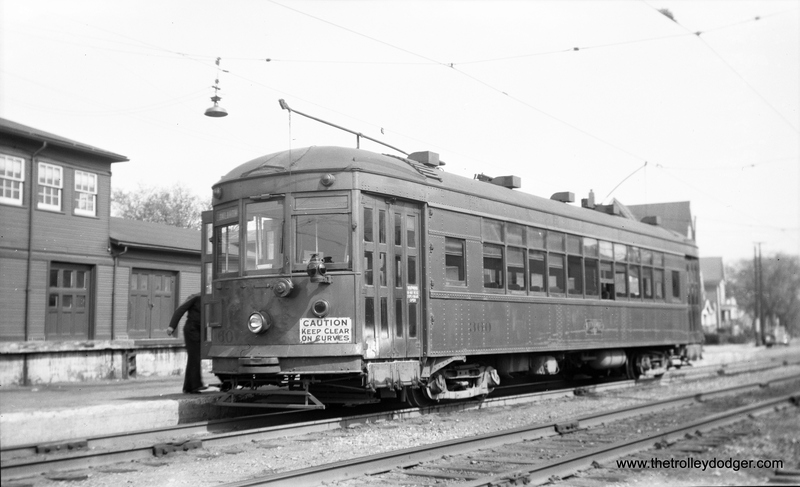 Our very first post (January 21st) featured the Chicago, North Shore and Milwaukee railroad, and it is high time for another look at that storied interurban. 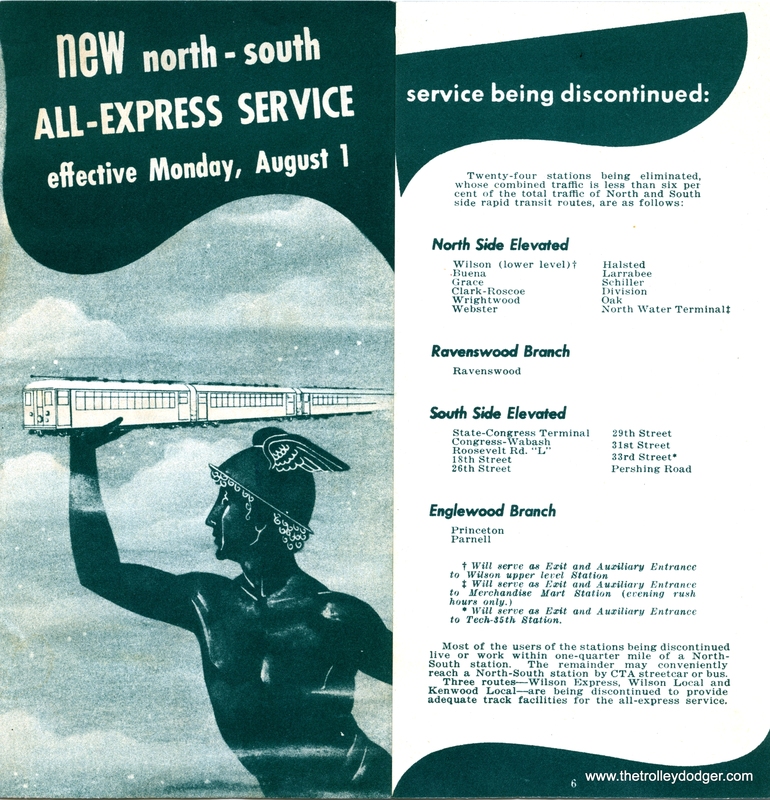 Last month was the 60th anniversary of the abandonment of the Shore Line portion of the North Shore Line system, but since we showcased the Chicago, Aurora & Elgin in several posts last month, we did not have the opportunity to commemorate that. In the first of two posts, we offer a potpourri of classic North Shore Line scenes for your enjoyment. CNS&M line car 606 at Kelly Siding on July 14, 1959. The colors on this slide have been digitally restored, after having been shifted to red. The original slide must have been one of the early Ektachromes or Agfachromes that turned out not to have stable dyes. 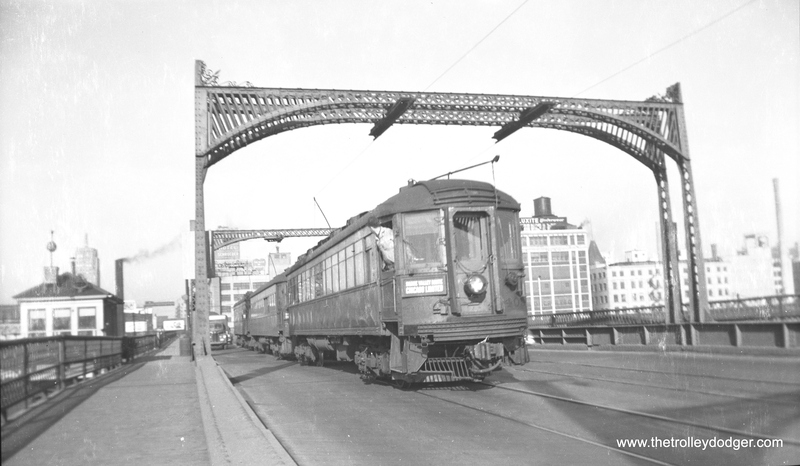 NSL 711 passing a CTA gate car at Jarvis looking south in the 1950s, headed for the Mundelein branch. 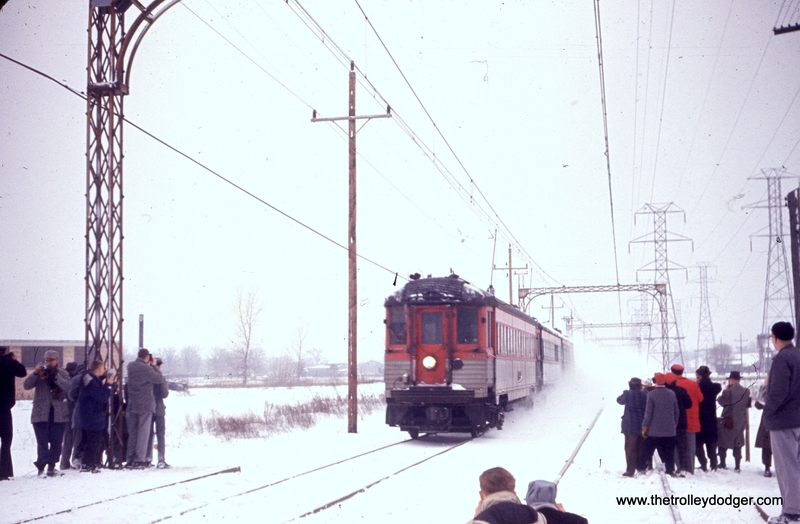 A snowy Skokie Valley Route photo run-by during a North Shore Line fantrip on February 21, 1960. 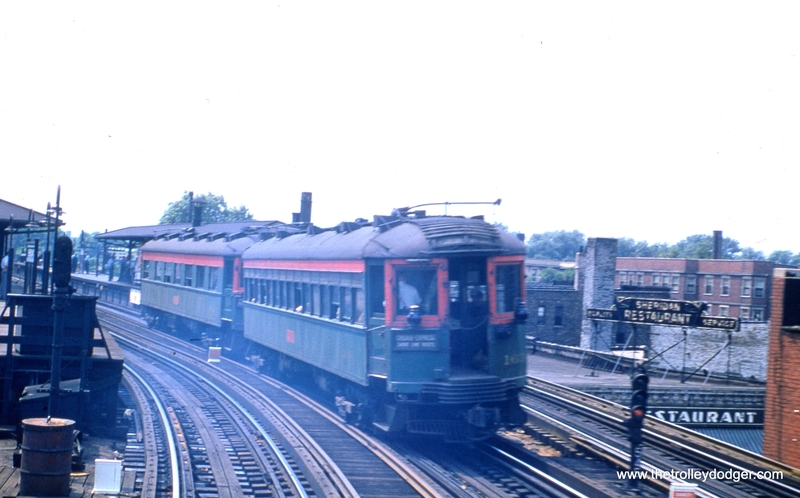 NSL 167 is at the tail end of a northbound two-car train approaching the CTA Sheridan Road station on July 6, 1955. This was a Chicago Express on the Shore Line Route during its final weeks of service. A single car NSL Chicago Limited crosses the Chicago River heading south on Chicago’s “L” system. CNS&M 182 heads up an eastbound train at St. Mary’s Road in the Thornbury Village subdivision (Glen Oaks,IL) on the Mundelein branch on May 31, 1962. I am seeking your assistance in figuring this out, as you seem to be particularly knowledgeable in matters pertaining to Chicago interurban history, and your blog posts have been filled with helpful resources. For a while now (and to no avail) I have been trying to determine what a typical consist would have been on one of the CNS&M Limited/Special trains (e.g. the Prairie State Limited, the Badger Special, Gold Coast Limited etc.) in the Insull years. I am currently attempting to model one of these trains (though not any one in particular) in N scale, and I have so far acquired both a steel coach and a parlor-observation car (#420). Unfortunately, I cannot seem to find any resource that would let me know what other coaches to acquire for this purpose. Most photographs (that I have come across) featuring these trains focus primarily on the parlor-observation car, and are taken at such an angle that the numbers and window configurations of the other coaches cannot be determined with any accuracy. I have thus far been unable to find any sort of car assignment records from this era. I come to you with this in the hopes that perhaps you are privy to some sort of documentation, photographic or otherwise, that could help me solve this issue once and for all (Or could perhaps point me in the direction where I could find this information myself). Two coaches from the 737-776 Pullman or Standard cars , followed by the 418 or 419 diner and on the tail end you can use your 420. If you want to back date the train a few years use the 409, 414-416 diners and some coaches from the last order from Cincinnati along with Observation cars from the 410-413 group. I don’t think the train length ever or rarely exceeded 4-5 cars on the name trains. 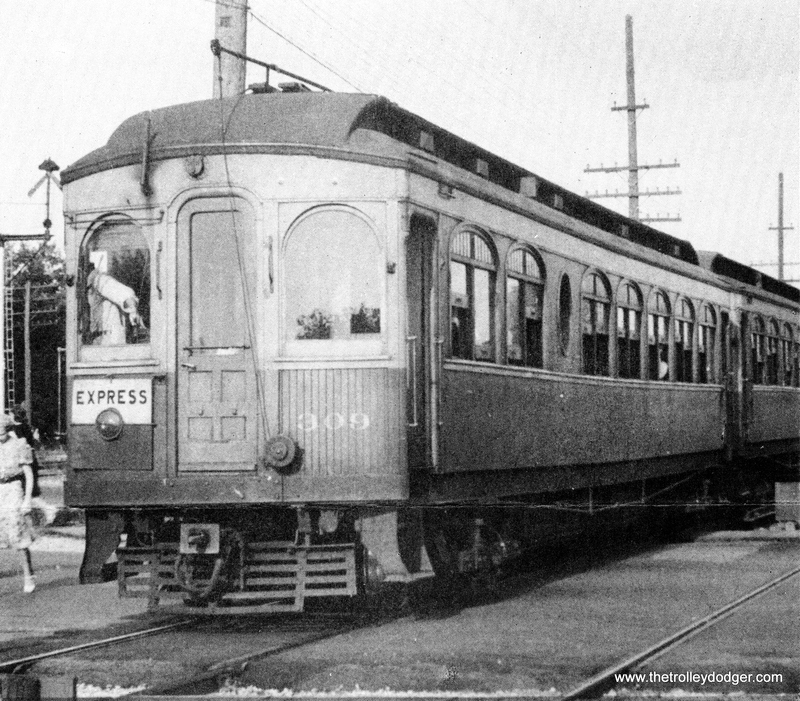 I have seen pictures of North Shore trains with 6-7 cars and two diners but I don’t believe they were name trains. I wanted to model these trains too, I couldn’t make up my mind which ones so I am modeling all of them!! It’s been a long time since I looked at any of my CNS&M timetables, let alone any from the name train era…but I want to say that you would see a diner OR an obs car on a given name train, but not both. To a certain degree, that would be duplicating services, as both types of equipment had parlor and/or meal service. I assumed the diners were for the coach passengers on the named trains? I believe that the name trains in those days, pre-Electroliners (and maybe some even after the E-liners) carried a dining car. 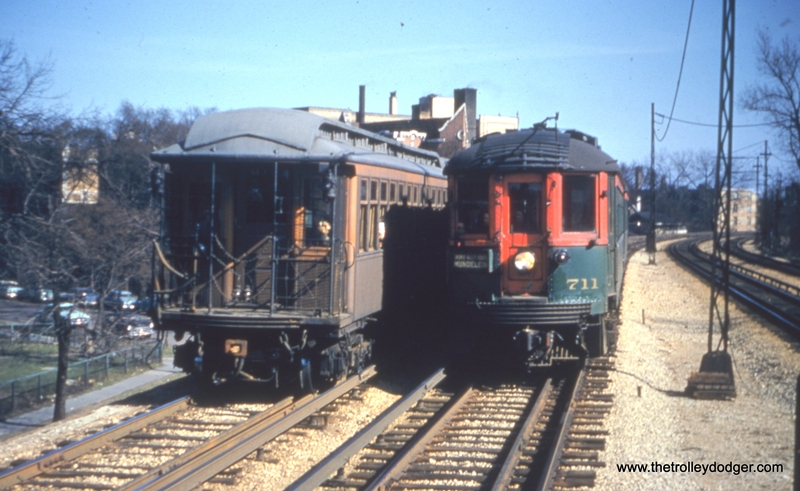 The North Shore used to be able to loop in Milwaukee so the parlor open end cars could turn easily. North Shore used to terminate further north until the new station was built. Obviously pre-Electroliner. The Liner solved turning trains. 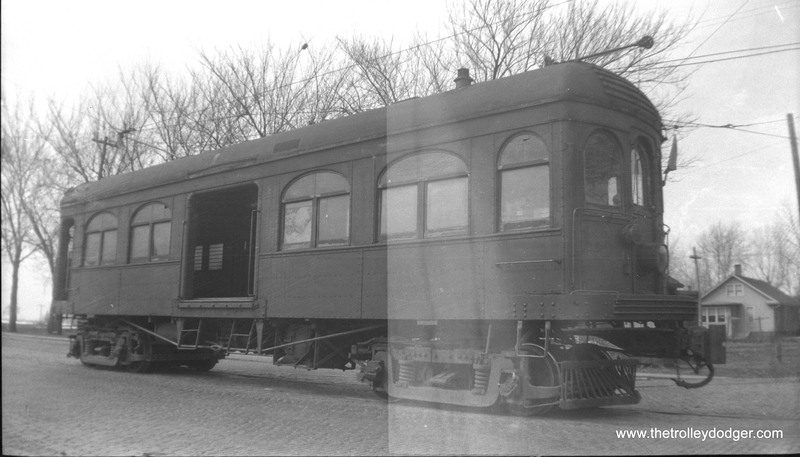 The Limiteds could have the usual coach cars, the diner and the Parlor. Probably if you can find the CERA books on the North Shore you may have good info there. The parlors were deadheaded to Harrison to use the wye and be re-stocked. There would only be coach passengers on a train with diners. I believe for a very short time the noon train, The Cream City, carried both a diner and a parlor. After the work rule of one trainman per car was changed diners ran second out in a consist leaving the hind end free for making adds and cuts. The kitchen was generally placed facing the rear so the conductor who worked the head 2 cars would not have to continually pass through the corridor into the dining room. That (a diner car and a parlor car) makes a nice looking train but I don’t think it’s prototypical. I note in another email that only one train for a very short time carried both. Diners didn’t provide parlor accommodations until after ’32 when the full parlors were discontinued. Parlor meal service remains a mystery to me. I’ve never seen a photo of the kitchen or a menu. 1923 – 1930 was still in the prohibition era so all my imagination tells me is lemonade and a sandwich. Parlors ran in non-meal time periods. If you look at the track diagrams, the observation cars could also be wyed downtown at 2nd and Wells St. on the streetcar line, a much shorter deadhead then Harrison Avenue. I don’t know if they were but it was possible. The first dinner-parlor cars operated from this location when the terminal was located there before the 6th and Michigan location was built. Also I think restocking took place at the 6th and Michigan terminal. Harrison Avenue shops did not seem to have a place for a commissary while there was food service in the downtown station. Dining cars: Daily; 901, 415, 905, 900, 414, and 906. Daily, except Sunday; 405, 413, 429, 412, 904, and 426. Parlor Cars: 915, 903, 415, 421, 900, 902, 420, and 916. The two trains that had both, 415 and 900, the 415 was the Cream City Special departing 63rd-Dorchester at 11:33am for Milwaukee via the Skokie Valley Route, arriving Milwaukee at 2:05 PM. The 900 was the Interstate Limited, departing Milwaukee at 7:15 AM and operating via Skokie Valley to 63-Dorchester, arriving 9:46. Hope this is helpful. Of course, I’m sure it changed from timetable to timetable. That diner and parlor consist didn’t last long. Hard to find in timetables. The thought of it fascinated me for many decades. 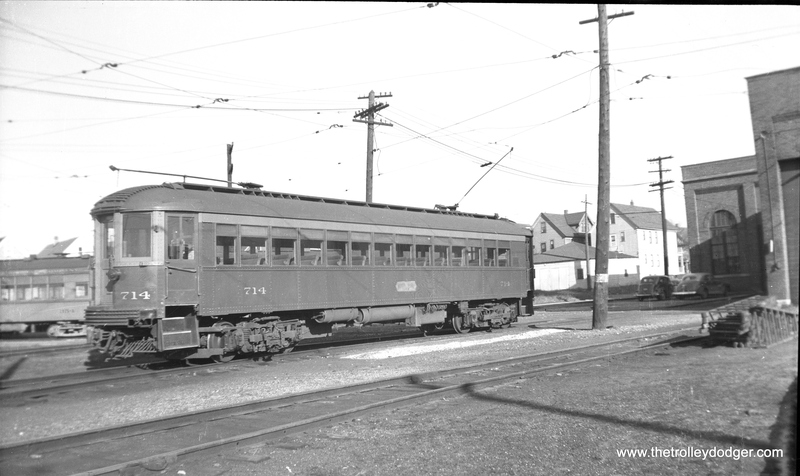 On the South Shore after the arrival of the short parlors, Diner + parlor consist existed on 3 round trips with the long parlors appearing only mid-morning and mid-afternoon. I’ve seen photos of the kitchen in a long South Shore parlor and it had a broiler arrangement similar to Pullman broiler buffet cars indicating some form of hot meal service. I wasn’t there, and I can only report on histories I’ve read. Yes, physically you could tote a parlor with a motor on to the street, then shove the thing all the way in to the midst of downtown Milwaukee streetcar traffic, both NSL and Milwaukee Electric, cross over to the opposite main for the return to the depot, and then re-stock, clean and prepare for the return trip in an hour. The prospect of that move in my mind as an operating railroader is questionable. Dining Cars: Daily; 901, 415, 905, 900, 414, 904. Monday only; 921. Saturday only; 417. Daily except Sun; 413, 427, 412, 426. Daily except Sat/Sun; 436. Parlor Cars: 903, 421, 431, 902, 420, 430. I have not scanned all of the timetables yet, it jumps from 23 to 52 which was in 1942. This does not tell much about the consist, but I would have to guess the cars other than dining or parlor cars would be however many motors they needed. Perhaps 3 or 4 given the publicity photos I have seen from the 1920s. 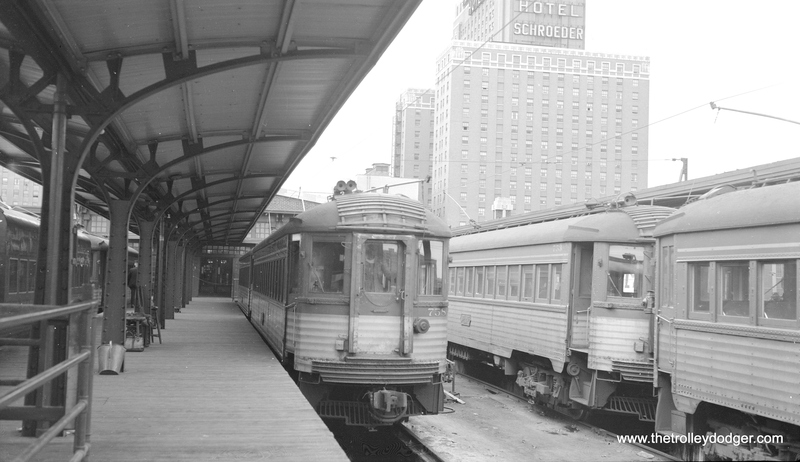 In addition to handling of diners and observation cars in Milwaukee, before the new terminal how did the NSL handle empty incoming cars after passengers were unloaded? 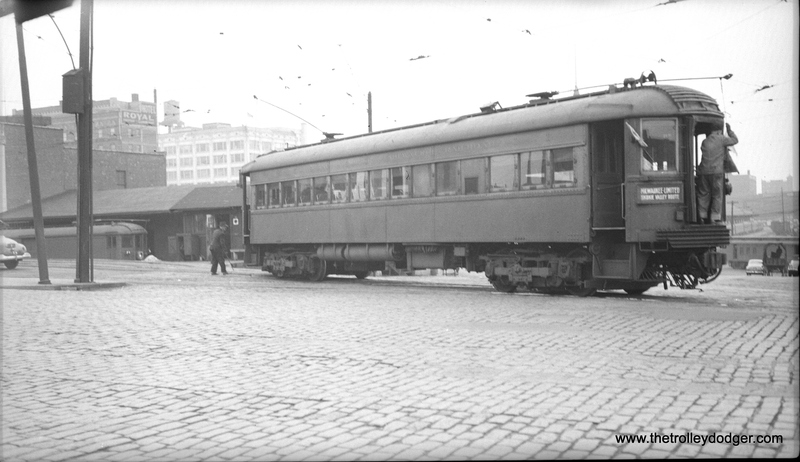 Although dining and/or parlor/observation cars sometimes were wyed at Harrison, it was much shorter and easier to wye them at 2nd and Wells. After unloading, the last coach (motor car) and the parlor/ob could have been cut from the train, backed into the intersection, changed ends then proceeded to 2nd and Wells with the motor car leading. There it would likely pull south on 2nd, then back across Wells, then headed west on Wells again with the motor car leading. At the station, the two cars could be backed into the station and additional cars added to the front to make up the next train out. If they were wyed at Harrison, a motor car would have been added to the rear of the parlor/ob to pull it through the city, not push it. Do you have direct evidence that this was the way? I know in Campbell’s book he says he saw the cars taken to Harrison. After service terminated at 6th and Michigan my opinion, and it’s merely my opinion that making a move with those cars into downtown traffic (streetcar, pedestrian, and other) along with trying to fit the move on Wells Street where the tracks were also used by Transport Company streetcars, along with presenting limited train equipment in the area where the old depot was would be questionable. The distance may be shorter to run up, but my opinion is that the safer. Most efficient route would be down to Harrison. 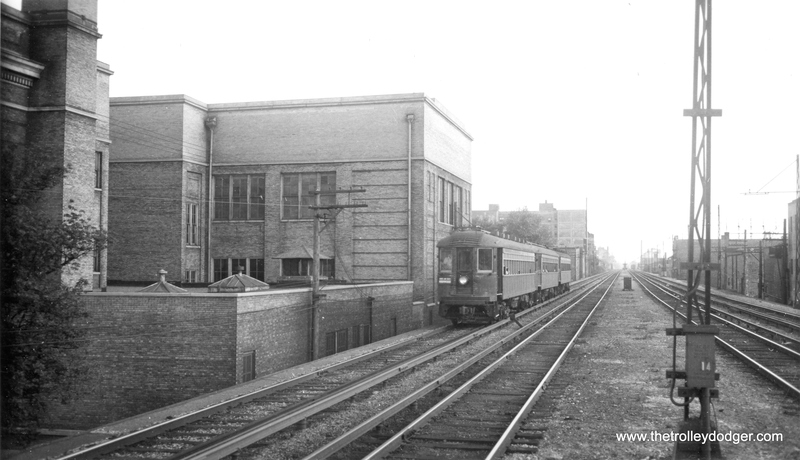 Before the new depot opened and the trains went to 2nd and Grand (Wisconsin I believe) there were no obs cars. There were the parlor diners. My opinion, and it’s merely my opinion, is that the consist changed ends, crossed over and waited to depart. I think we can consult some early timetables to see the times and frequencies. It was that very short span in 1926 where there was a consist with both. I based my consist info on that very article (business trip on the Cream City Special). I also know that in the old footage of the Eucharistic Congress they clearly show not only a parlor obs but the sharp viewer will also spot a 404-406 (I think) parlor diner made up as a full parlor car. I think that there were plenty of instances and opportunity where the two were used together, granted perhaps not on a scheduled train. I am thinking about the number of cars they had after 1928. 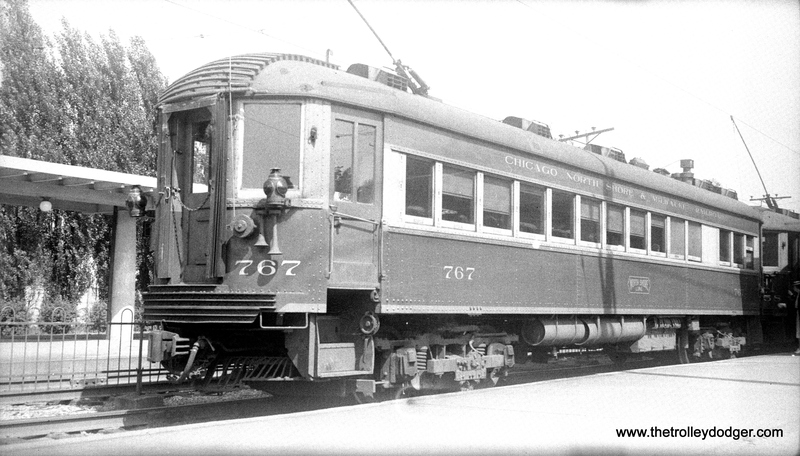 404, 405 and 406 were converted to coaches by Cincinnati in 1923 (734, 735 and 736). 407-408-409, 414-417, 418,419. I think some were stored in 1928 (maybe the 407 and 408), I don’t know how many were still in use by the time the 418, 419 and 420 were delivered in 1928 but it could be as many as seven diners. 410-413 and 420. So there were enough parlor obs and dining cars cars to cover at least 5 trains a day in both directions. I spoke to George Campbell (years ago) and he was very certain the cars were towed to Harrison St. to be turned and serviced. That makes the best sense, to clean them up after every run, check the cars out, keep them hot and ready. 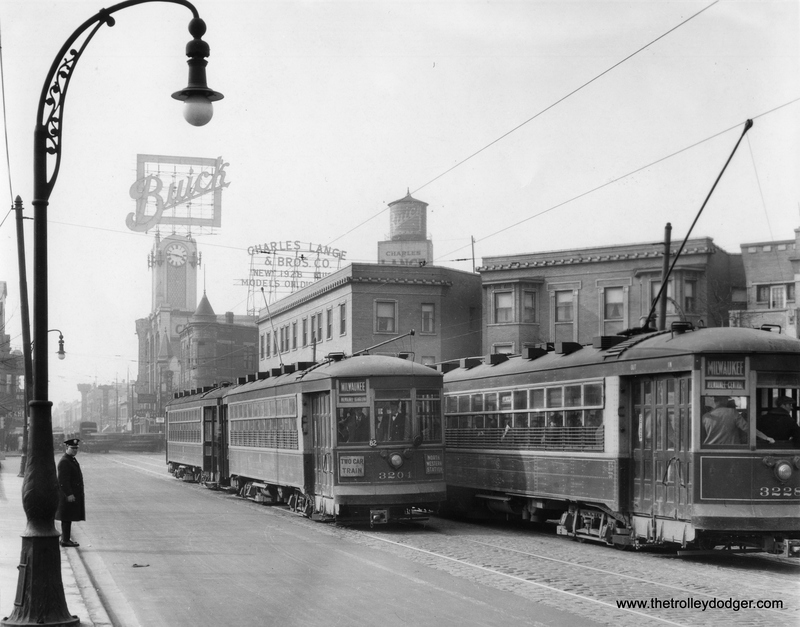 Milwaukee had lots of street trackage and the new depot existed then during the parlor years. NS had only recently exited the older terminal. I found a timetable in the North Shore Memories book listing the parlor trains. The first parlor train of the day arrived in Milwaukee at 10am. The next parlor departure was at 3pm. That’s a gap of 5 hours. So there was no rush to make a difficult move up to Wells Street. We haven’t discussed the need to wash a limited train. The line, in competition with and in good operation wouldn’t receive passengers, let alone parlor passengers in a soiled car. I’ve done a lot of research on the Eucharistic consist. The diners were very new 416 and 417. Indeed the car closest to the obs was stripped of tables and chairs and replaced by parlor chairs. The car was returned to its diner self right after the move. All cars on the train were brand new except the obs which I believe we determined was 413 as it had just been painted. I was just reading something of that, the tables removed from one end of the diner and chairs placed, parlor seating charged and food was served. Some limiteds made zero stops between Milwaukee and Evanston. Just a reminder, the Milwaukee station had pits to service. If you could loop the Parlors around in Milwaukee and spot them at the station that’s a possibility, not that they didn’t or wouldn’t, but when that might have been lost, they would have to run to Harrison. But the Station may not have had heavy service tools if needed. Quick lubes possible tho. The main roster cars obviously could use it. All I’m saying as a former operating guy from the South Shore is that me, Mitch, would not run a 3 car consist into a busy area clogged with traffic and trolleys to turn equipment not needed for another 5 hours or so, only to leave it sit, unwashed, in the depot. That is only my opinion, not specific knowledge or a directive. 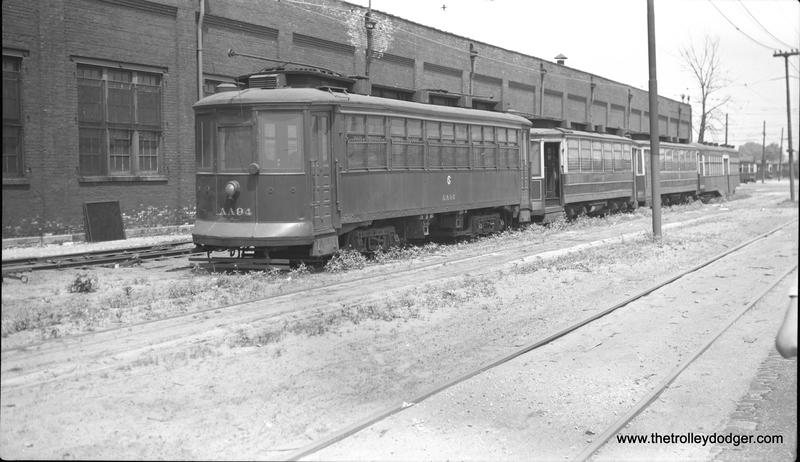 It’s merely my opinion that a consist in limited train service in those highly competitive years would warrant more of a detailing sort of washing aside from washing the windows as the South Shore used to do at Randolph Street. Wells Street on the CA&E had pits. Other than that I know of no other operation that had that at terminals. meal, served on a tray, sitting in a parlor seat, with chairs and tables behind her in what could only be a diner. If you have the book “Route of the Electroliners” and you go to the equipment section under the 418-419 dining cars there’s a broadside photo. One can see in the location I mentioned the backs of several parlor chairs. Something I had always wondered about until I started looking deeper into the matter. I’m with Mitch , as a current railroad employee I would not want to do switching on city streets either. What a hassle that would be with single point switches and high potential for a high profile derailment and employee injury. Harrison Street is the safe course. If the comment about washing the exterior of the train was valid, Harrison Street it is. I don’t believe the North Shore wheels worked well on TMER&L street track so I wouldn’t risk damage or derailment. That brings up another issue. In CERA 112 it does talk about the North Shore’s display at the Wisconsin State fair and states that the wheels had some damage from this incompatible wheel rail interface. George Campbell also adds that Tony Bauer recalled it in George’s book “North Shore Line Memories”. 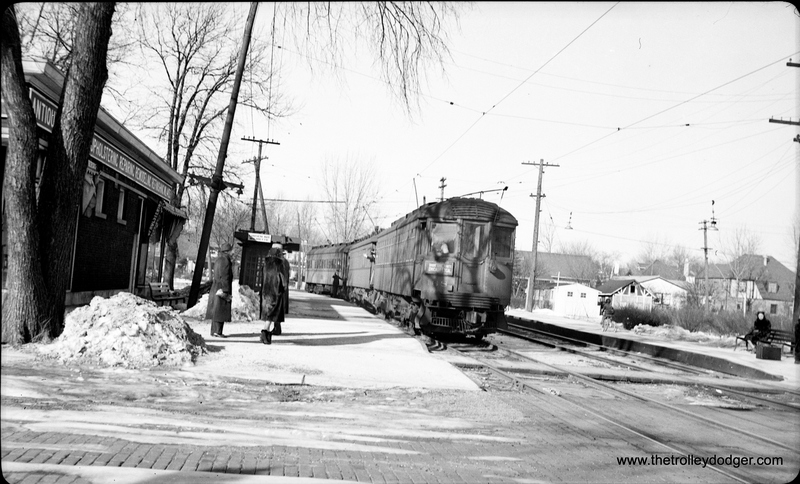 How did the somewhat well documented special trains to St. John’s military academy (with a diner) make it to Delafield without wheel damage? 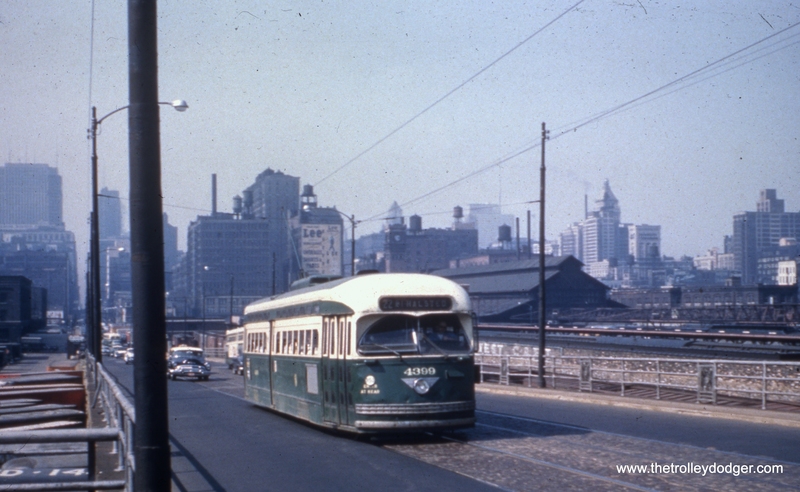 I believe this was before the rapid transit line so some TMER&L street running had to happen? 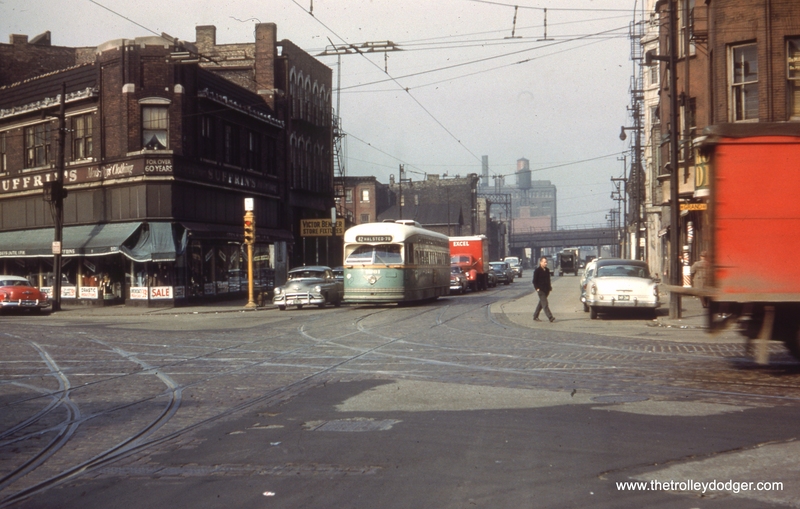 It is my understanding that on that portion of Wells Street the track belonged to the North Shore as it was part of their city line which started before the interurban service started as by franchise they had to provide local city service for entry into Milwaukee. This was also true for the Milwaukee Northern which also had its own city service as well. I suspect the issue with wheels was tread width with the North Shore using a “railroad” wheel and the TM which used a compromise wheel with a somewhat narrower tread. North Shore used a standard width wheel while TM were narrower. When we ran TM 1121 to Green Bay Junction it was the only car accepted. 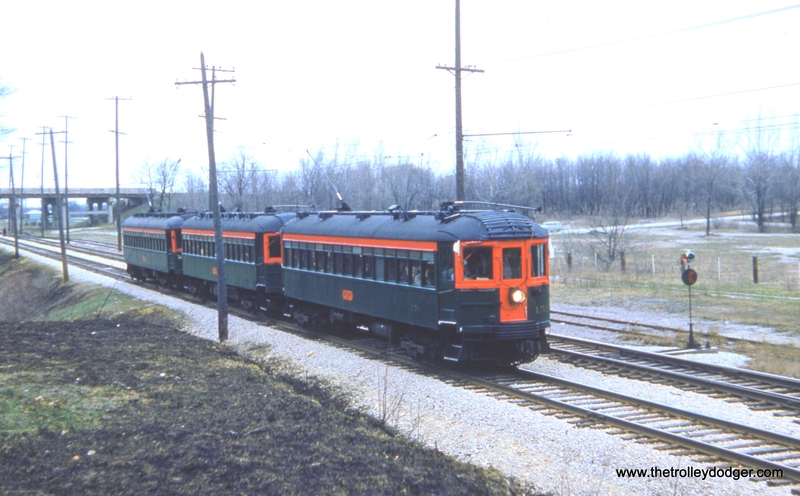 There was a festival which included a race using pump cars between Milwaukee Road and North Western on Wisconsin Road. One of them had the flanges cut back and the race became a joke. I don’t remember which one but it was a toot. In addition, North Shore wheels were different than standard wheels. North Shore wheels didn’t have a slant, instead they were even. They felt they would be smoother. I don’t think the turned cars were done at 2nd but rather to Harrison. It was a lot easier and other services were there. The tracks on Wells Street in question were the property of Chicago and Milwaukee (NSL.) But in order to make a wye move, and this is a question, wouldn’t part of the wye move be made on ME trackage, and disrupt their car service? If I were a betting guy I’d bet the equipment was washed thoroughly, and they may have even given the brass railing a dab of polish. The trackage on Wells between 5th and 2nd was NSL (C&ME). TMER&L later got permission to use it, connecting to its own tracks on each end. The wye was made using trackage on Wells west of 2nd, trackage on 2nd south of Wells (old station), and trackage on 2nd north of Wells. This would have been all NSL trackage. Although turning the parlor/ob cars at 2nd and Wells would have meant several blocks of running through downtown traffic, it still would have been much quicker than running all the way to Harrison and back. If street traffic was clear I guess it would be. But the consist had to be washed and the first parlor arriving in Milwaukee showed up at 10am and didn’t have to go out until 3pm. So, again, what’s the rush? Thank you to David and all of the list members who contributed information to the discussion. I do believe I now have enough information to determine my consist, and I will upload images of the finished product at some point down the line. 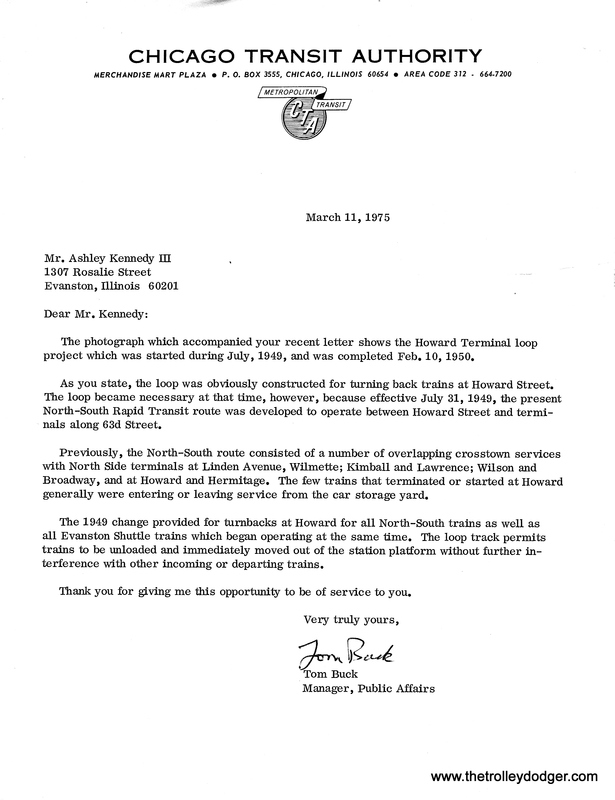 Our thanks to the members of the North Shore Line Railroad Yahoo Group who contributed to this discussion. Hopefully this provides the requested information. 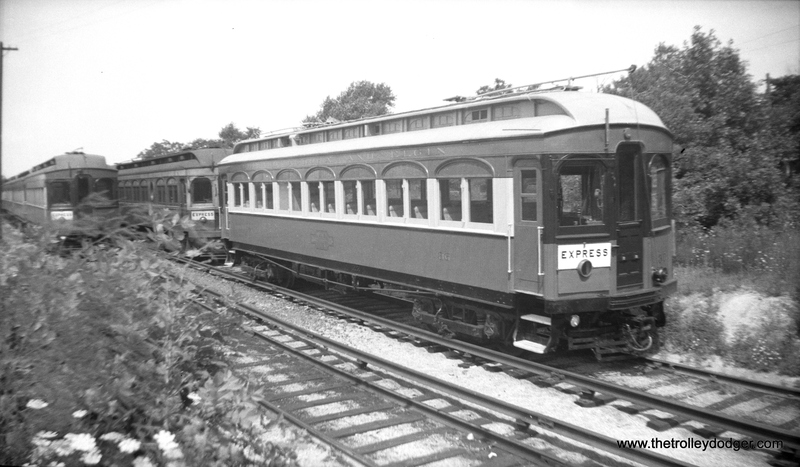 In 1940, car 415 was converted to a “tavern lounge.” June 4, 1949 was the last day of dining car service on the North Shore Line, except for the Electroliners. 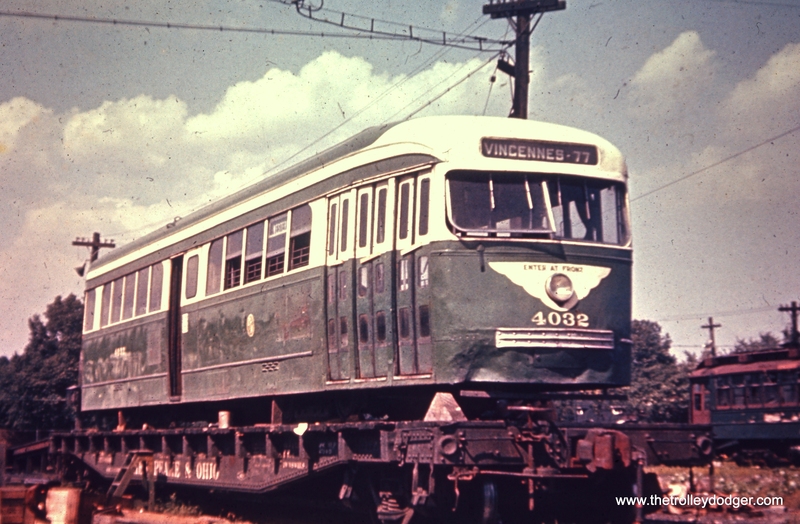 By October 1950, car 415 had been repainted as a “Silverliner,” and was used on the ‘substitute Liner’ when those cars were in the shop for regular service. 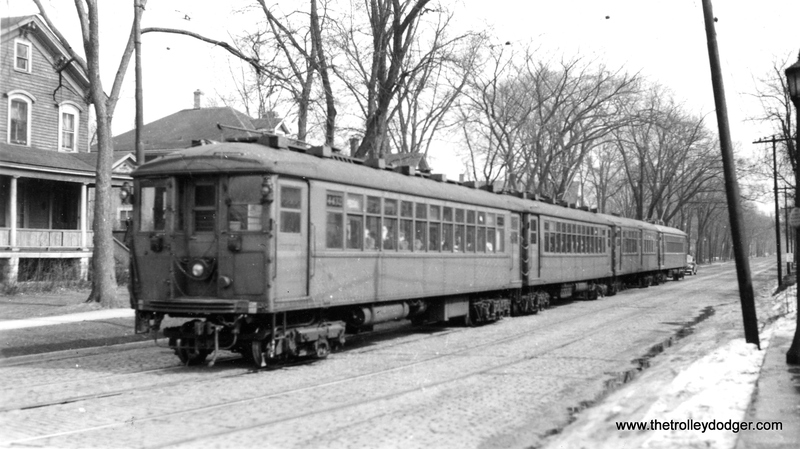 After CNS&M abandoned service on January 21, 1963, car 415 was sold to the Railway Equipment Leasing & Investment Corporation, which was associated with what we now know as the Fox River Trolley Museum in South Elgin, Illinois. 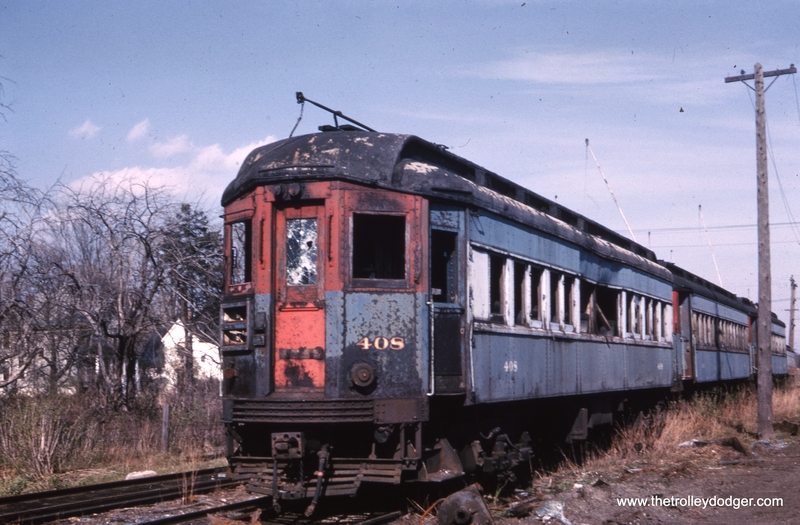 The car was then sold to Seashore Trolley Museum in 1977 where it remains today. I was born and raised in Jackson, TN. 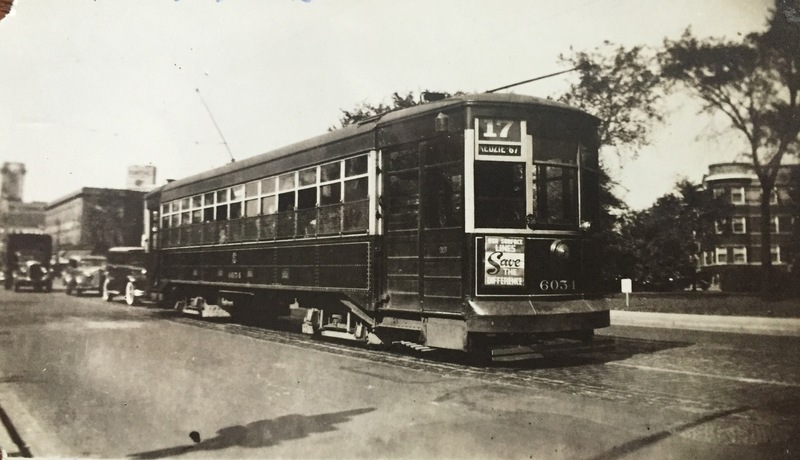 The trolley car photo attached was owned and operated by the Jackson Railway and Light Company. Can you help me identify the manufacturer, model, year and color scheme? My guess is a Brill about 1918. Thanks for writing. My initial search did not turn up much, but we will naturally keep looking. This must have been one of the smaller properties. There doesn’t seem to be anything about it on Don’s Rail Photos. 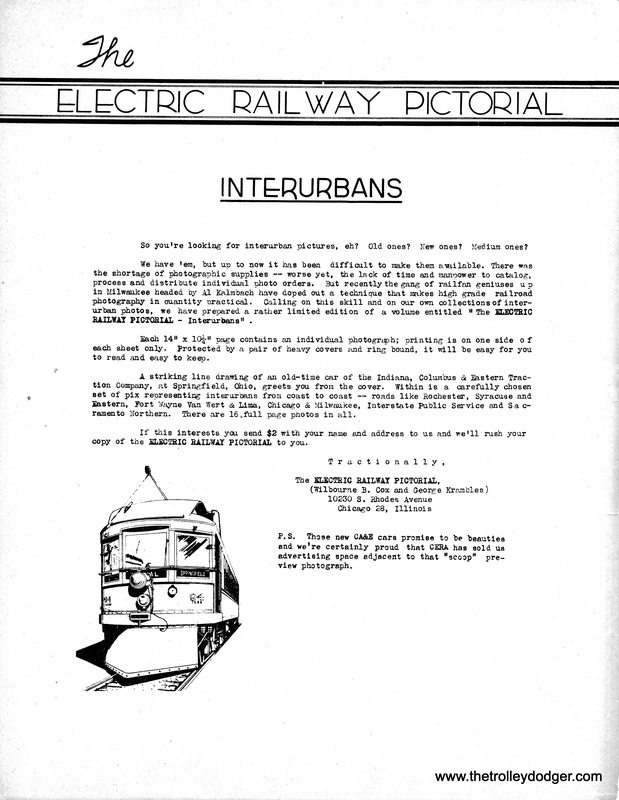 There is a mention in a 1916 issue of Electric Railway Journal that Jackson Railway and Light Company was in the market for a couple of one-man car bodies. From the September 9, 1916 Electric Railway Journal, page 474. I’m president of a group called Logan Square Preservation and I’m also putting together an exhibit and book on the history of the neighborhood. I found the attached photo on your site and would like permission to use it. We would, obviously, credit you for the image’s use. 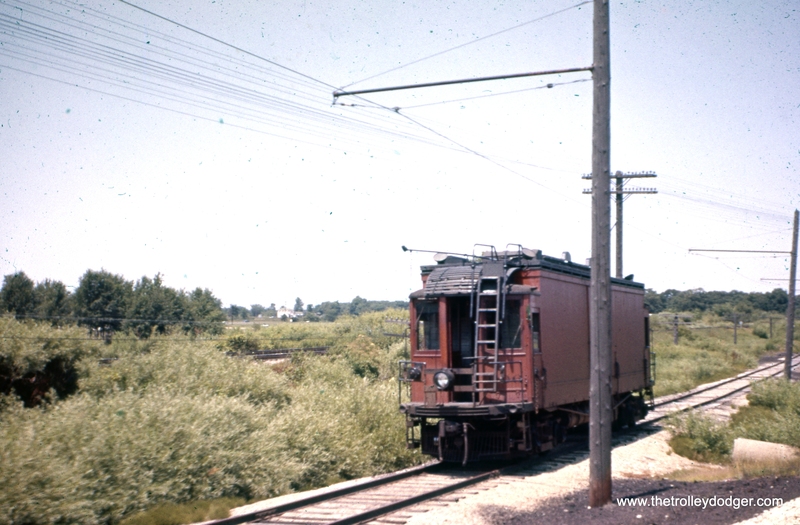 If you’re interested, I may also be able to share some photos in our archive of trolley cars in the neighborhood – we have a few – one in color. Naturally, we are glad to allow such a use, thanks. 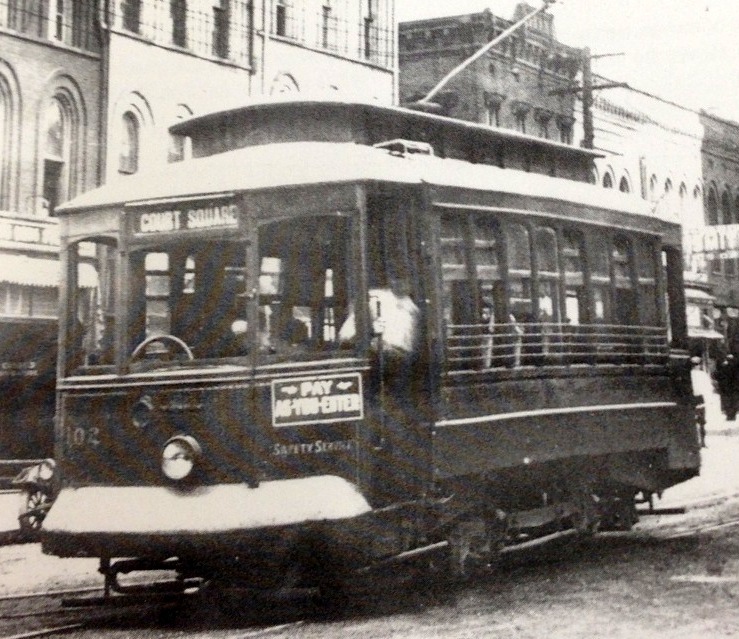 (The photo in question, reproduced below, originally appeared in our post Chicago Streetcars in Black-and-White, Part 5 (April 18). His group likes this picture so much that they may use it on the cover of their upcoming book. I’ve been enjoying tremendously the CSL photos you’ve been posting on your blog; thanks for putting all of these great photos online! I am writing because I am working on historical articles about two of the CSL cars in the IRM collection, the two ex-South Chicago City Railway cars, 2843 and 2846. I’ve completed a draft of an article about the 2843 that also describes the SCCR lines on the southeast side, and my hope is to follow it up shortly with an article about the 2846 that focuses more on the interstate routes over the Hammond Whiting & East Chicago. My question for you is, do you have any photos of either the 2841-2845 series Jewetts or the 2846-2856 series “Interstates”? I’m especially looking for photos of these cars in passenger service (pre-1932) but photos of IRM’s cars in work service (CSL 2843 and 2846, later CTA AA95 and AA98) would also be useful. And I’m in search of any photos of South Chicago City Railway cars prior to the CSL unification, including earlier single-truckers. Anyway, any help would be greatly appreciated. Thank you for your time! The article on CSL 2843 appeared on the excellent Hicks Car Works blog on April 9. At that time, we didn’t have anything to contribute, but a couple things have turned up since. I’m just starting to work on an article about the 2846-2856 series “Interstate” cars and I’m definitely on the lookout for photos of those cars. The cars of that series that were put into salt car service were renumbered AA98-AA107. 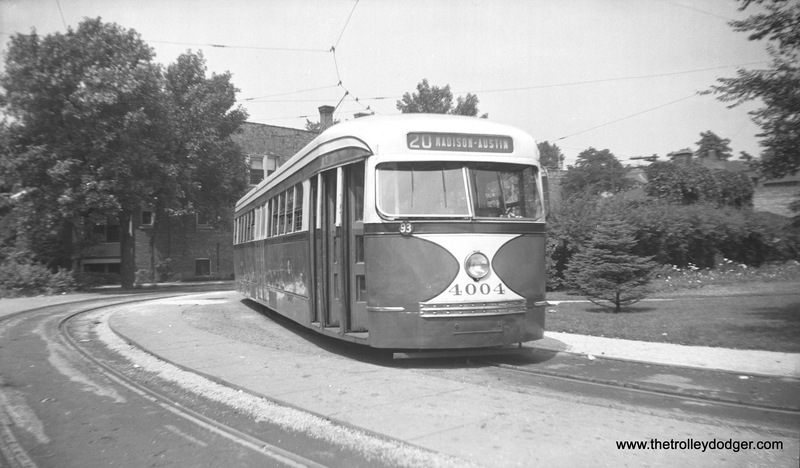 CTA work car AA94, the former CSL 2842, at 77th and Vincennes on July 4, 1949. 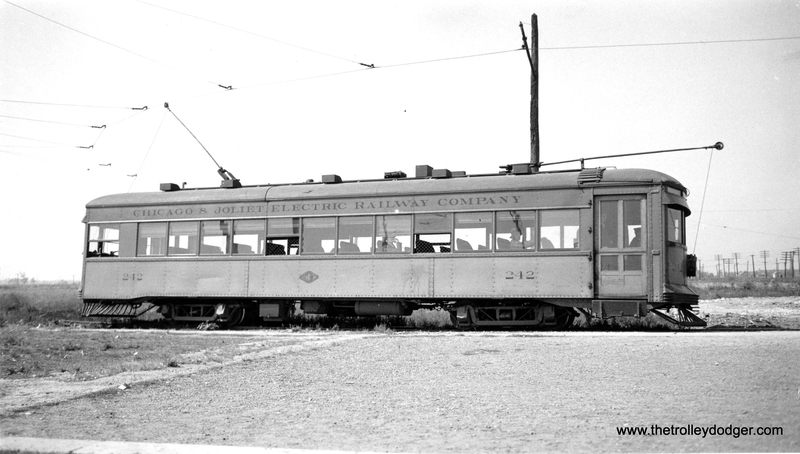 (Charles K. Wilhoft Photo) There is a similar, although not identical photo in the Hicks Car Works article on car 2843. Don’s Rail Photos says, “2844 was built by Jewett in 1903 as South Chicago City Ry 324. It became Calumet & South Chicago Ry 829 in 1908 and renumbered 2844 in 1913. 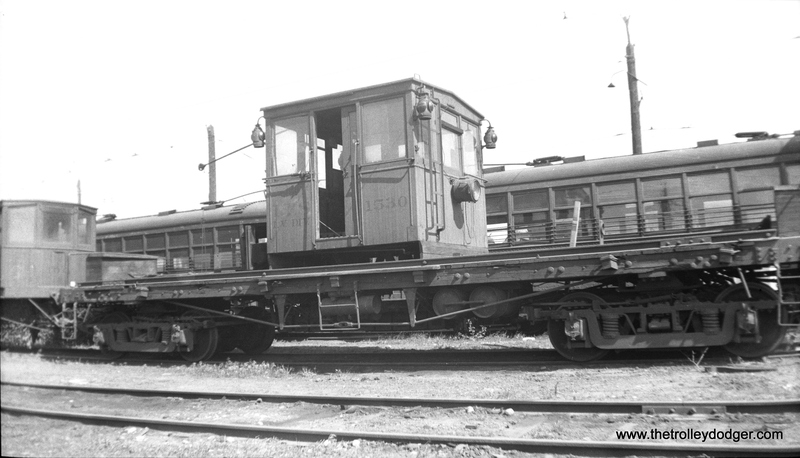 It became CSL 2844 in 1914 and was later converted to service as a supply car. 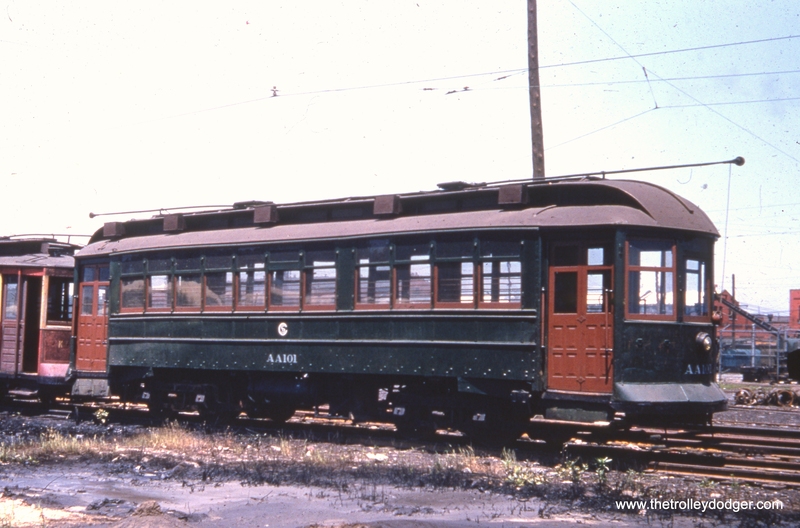 It was renumbered AA-96 in 1948.” The Hicks Car Works article on car 2843 says, “In October 1942 one of the Jewetts, car 2844, was rehabilitated at South Shops and sent to Burnside car house for service. The station superintendent there wanted nothing to do with the car; even as stretched as the Surface Lines was, an aged car poorly suited for one-man operations was not what was desired. So the car was sent back to South Shops and the decision was made that the Jewetts instead would be converted into salt cars. ” So this photo may date from that brief period late in 1942 when this car was put back into service after having been in dead storage for a decade. 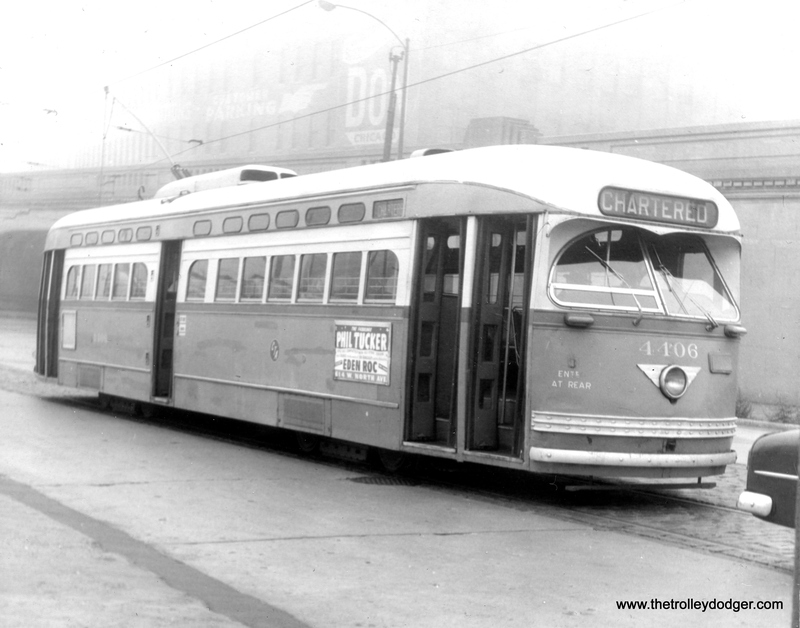 CTA work car AA101 at South Shops on June 14, 1955. According to Frank Hicks, this car was probably CSL 2849. It was originally built by South Chicago City Railway in 1907 and was a sister car to 2846, which is preserved at the Illinois Railway Museum. 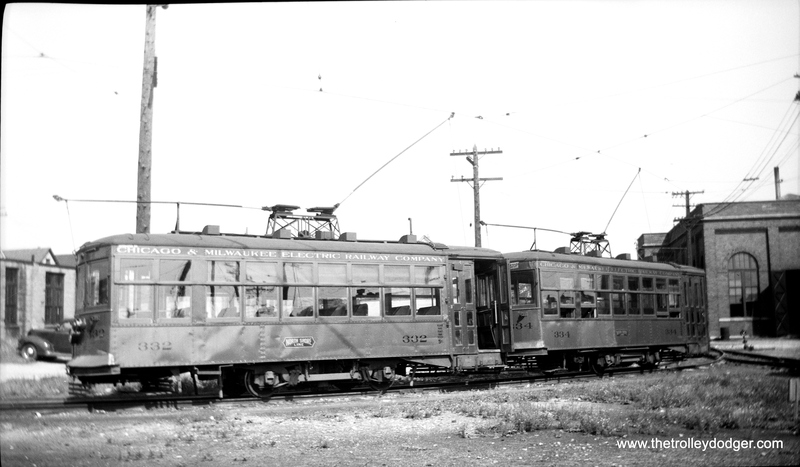 In my previous correspondence with you, I mentioned that the interurban car that began at the 63rd Place and Halsted L station went to Kankakee via Halsted, Summit, and Vincennes. 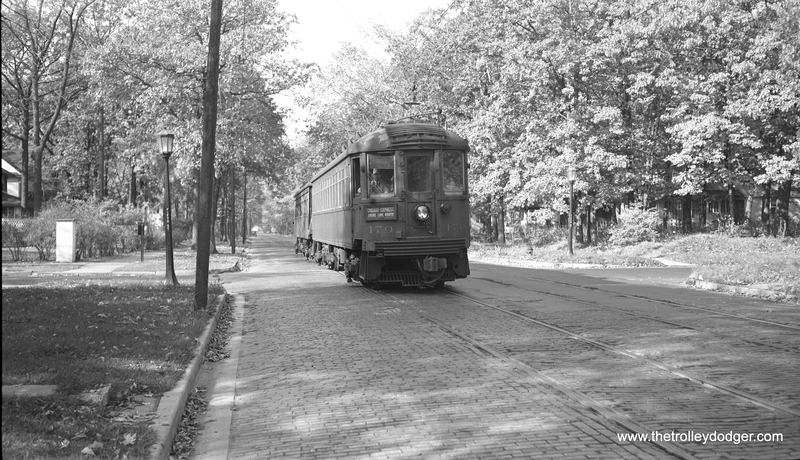 I also said there was a car barn at 88th and Vincennes that the interurban line used. I just didn’t remember the name of the interurban company. Reading through CERA bulletin #146 for a second time, I noticed that the caption on page 298 says the trackage on Halsted south of 120th St. was used by the Chicago & Interurban Traction Co. This contradicts what I know about the interurban trackage. (1) See http://www.chicagorailfan.com/maptinik.html . The route shown on this page is Halsted to Summit to Vincennes. (3) See http://www.chicagorailfan.com/maptcit.html . This map shows the entire route to Kankakee. (4) Vincennes Ave. goes south into Blue Island. From there, Western Ave. heads south, but soon becomes Dixie Highway, which at one point ran all the way to Florida. Present-day addresses in Google have Dixie Hwy. in Chicago Heights, so it would seem Dixie Hwy. (and the Kankakee cars) went southeast from Blue Island through Harvey, then south through Chicago Heights and Crete. 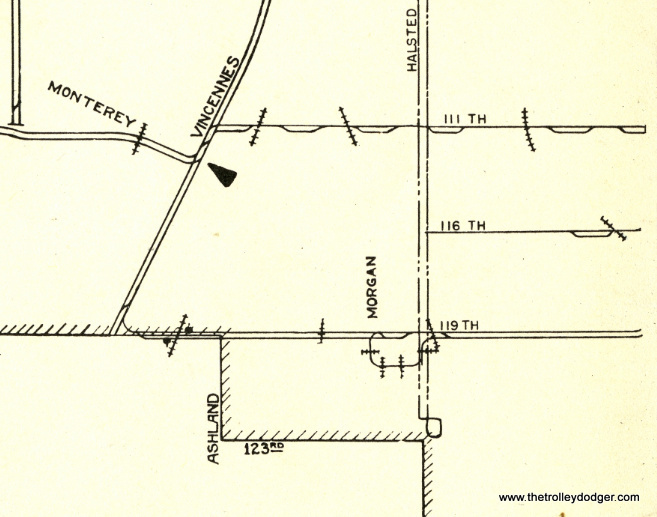 (5) South Suburban Safeway Lines was formed in 1933 (see http://www.chicagorailfan.com/histcit.html ). That company ran two bus routes from the 63rd and Halsted L station. One went to Harvey, going west on 63rd, south on Western through Blue Island, then south on Dixie Hwy., to Harvey. The other ran straight south on Halsted (with a slight jog to the west in Harvey to meet other routes) to Chicago Heights and Crete. The two bus routes were put in place to replace the interurban. 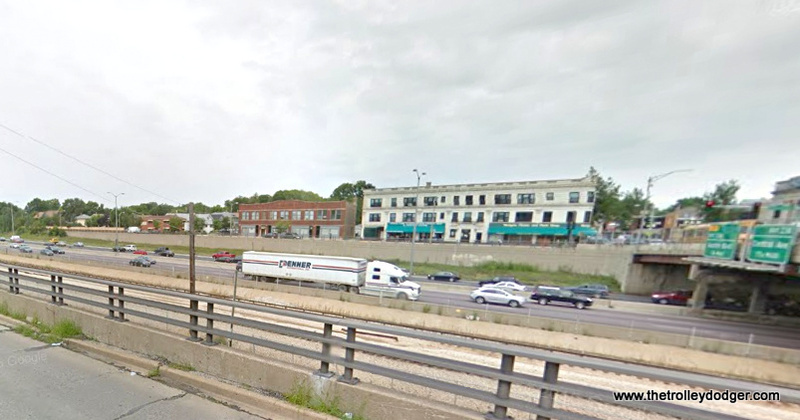 All of which leads to the question: What line used the trackage on Halsted south of 120th? I have no answer. 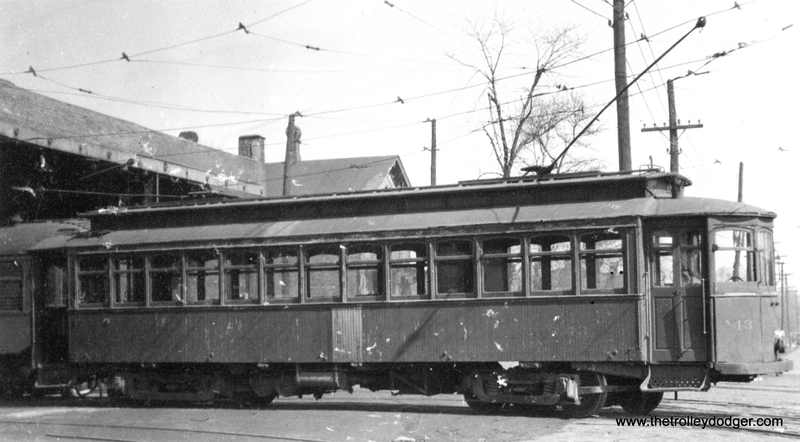 The Riverdale streetcar ran along Michigan Ave., not Halsted. 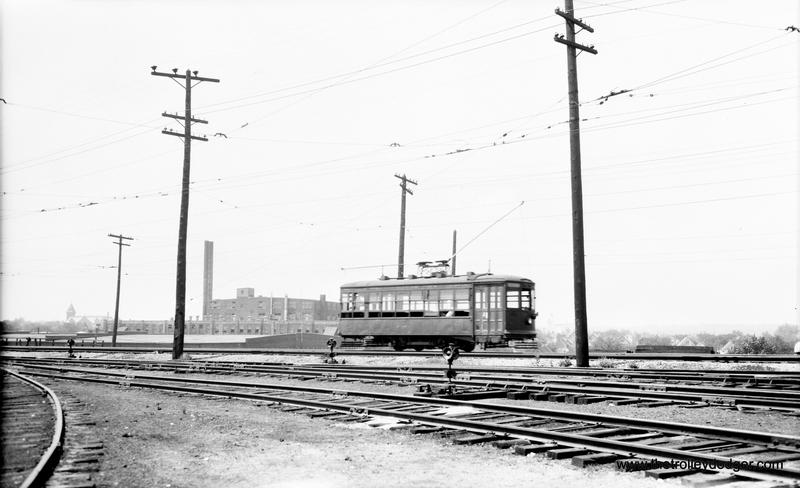 And the Chicago Surface Lines never ran streetcars on Halsted south of Summit (which meets Halsted at around 85th St.). Perhaps the trackage viewable on page 298 is a stub that may have been used as a terminal by red cars on either the State St. line or the 119th St. line. Or maybe there was a freight customer south of 120th St. Just some guesses. That’s an interesting question. You can view a map of the Chicago & Interurban Traction Co. here. Firstly, I do not think there is any dispute of the Kankakee Interurban’s route out of Chicago, namely Halsted, Summit, Vincennes, 127th, Western, Spaulding (alongside GTW), Page, 154th, Park, 157th, PROW to 161st/Halsted then south on Halsted. Now the matter of the Halsted track: Apparently at one point in history (1890’s) the routing on 119th St instead of continuing west to Vincennes just went to Halsted and then south to 121st. Possibly the intent was to continue to 127th or further, but a crossing of the IC Blue Island branch seems to have become an insoluble problem, and besides, the industrial area along 119th between Morgan and Ashland must have looked a whole lot more inviting and the Halsted track simply fell into disuse, but was not actually taken up for many, many years. You will find the Chicago streetcar track maps for 1941, 1946, 1948, 1952 and 1954 in our e-book Chicago’s PCC Streetcars: The Rest of the Story, available through our Online Store. 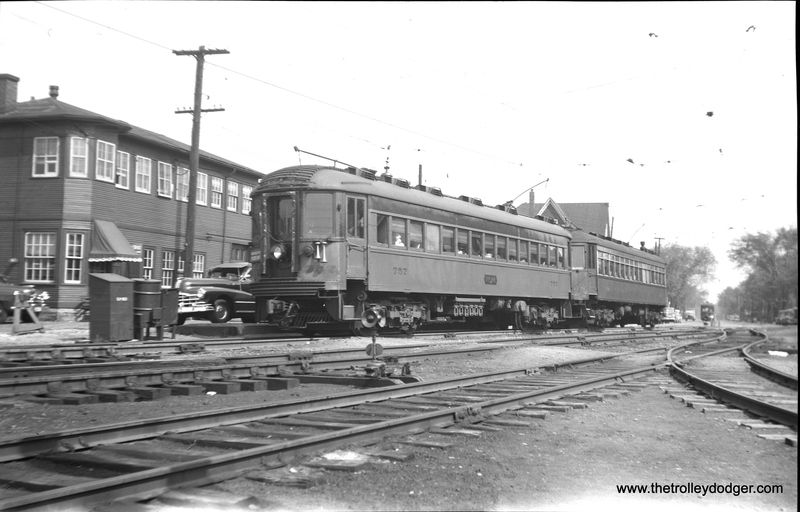 Chicago and Joliet Electric Railway #242, shown at the Archer and Cicero station in Chicago in September 1933. (Robert V. Mehlenbeck Photo) Mehlenbeck was member #11 of Central Electric Railfans’ Association. 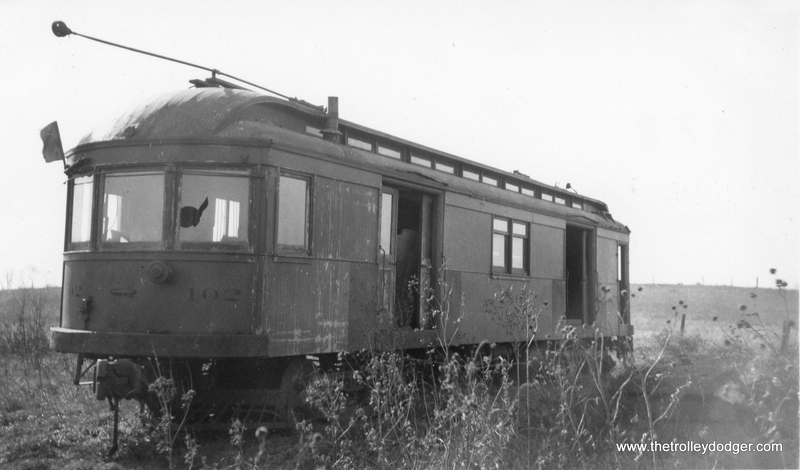 According to Don’s Rail Photos, “242 was built by Cummings Car & Coach Co in 1927.” Service on this line, which connected to the Chicago, Ottawa & Peoria, was abandoned on November 16, 1933. 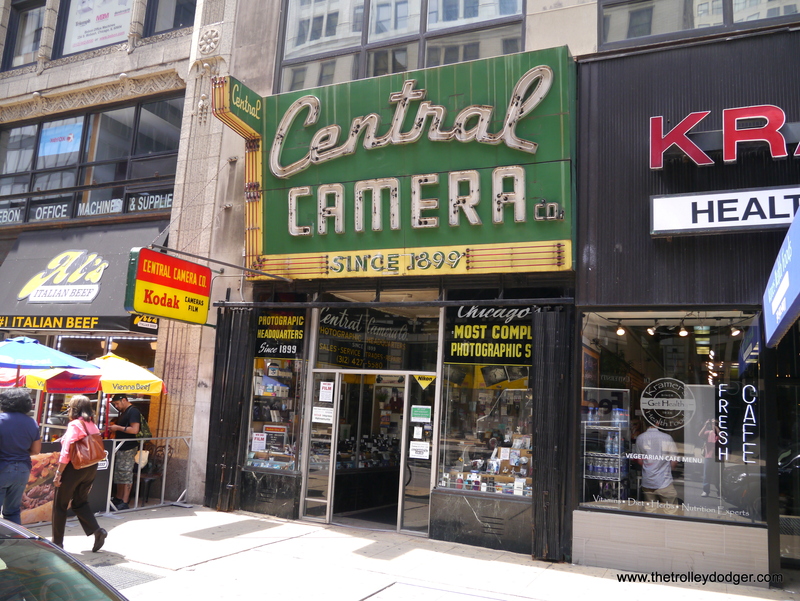 The iconic facade of Central Camera, one of the last remaining old-style camera stores in the Midwest. Today we will explore the close relationship between railfans, their cameras, and their favorite camera stores. Nowadays, photography has truly become both easy and democratic, in the sense that most people now carry around with them a cell phone that is capable of taking surprisingly good pictures. You see the results immediately, so there is a very short learning curve. If your picture doesn’t come out as intended, you simply take another. Chances are most railfans became photographers out of sheer necessity. They were fascinated by railroads and wanted to study pictures of them, yet had no idea where to find such pictures. So, they bought a camera and went out and made every mistake imaginable. They learned by doing, and over time, many railfans became excellent photographers, whose work is on a par with, and every bit as important, as any other shutterbug’s. Pieritz Brothers office supply store in Oak Park, in business since 1895, has a sign in the window that says, “If you buy here, we will be here.” The same is true of camera stores, which were once commonplace but have now largely disappeared from the American scene. Perhaps in the future everyone will order their goods online and have them delivered to their door by drone aircraft, but time was, if you needed to buy film, have film developed, buy a camera, or learn how to operate it, you went to your friendly neighborhood camera shop. There was a time when cameras were not commodities, and people depended on the experience and expertise of the over-the-counter sales person, who would spend time going over the features and even critique their pictures. In my own Chicago neighborhood, there was the Montclare Camera Company, on the same block as the Montclare Theatre. 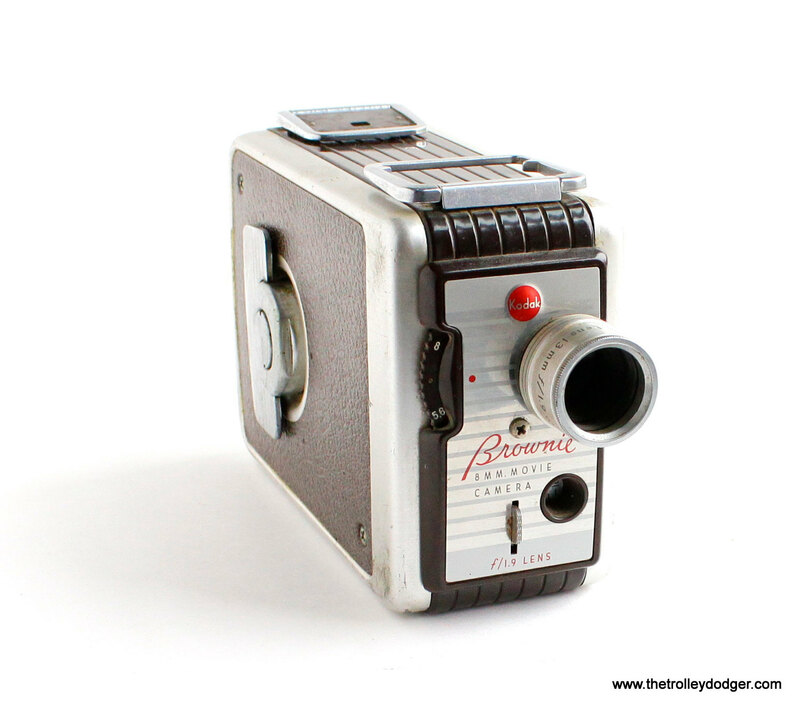 In the early 1960s, when I was in grade school, perhaps 25% of a camera store’s business involved home movies. It was a common thing to joke about back then how your friends or relatives would invite you over to their place for an evening of really bad home movies of their latest vacation or someone’s backyard birthday party. You could only record about three minutes of film on an entire reel. For some reason, the market for home movies had largely dried up even before portable video camcorders became available. In the early 20th century, enlargers were not commonplace. If you took your roll of film to the photofinisher, a camera shop or drug store, they would make contact prints of your black-and-white film that were the same size as the original negative. To yield a decent sized print, the film had to be very large as a result. Sometimes these large negatives can yield extremely sharp images today. Many people would take these prints and put them into photo albums purchased at their local dime store, often using paper corners to adhere them to the black paper. By the 1930s, railfans began trading and selling photos to each other. In some cases, they put together elaborate dossiers about certain railroads, complete with original photos and clippings from newspapers and magazines. 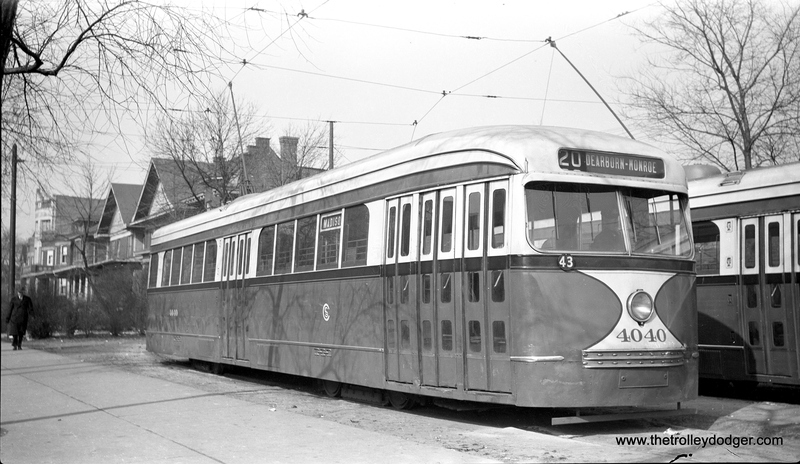 Others tried to compile complete sets of “roster shots” showing entire fleets of streetcars and interurbans. Among these early railfans is the venerable Malcolm McCarter, last living survivor of the original 10 founding members of the Illinois Railway Museum. He has been selling railfan photographs for 76 years now and may very well still print them himself, from his vast collection of negatives. You will find his catalog online here. There was so much to ride at one time, and yet those years must have been, in some sense, depressing. There was one abandonment after another, a nearly endless litany of bad news. We can be thankful for those early fans who were involved, in one way or another, in historic preservation, either through the fledgling railway museums, documenting things through photographs, or both. Fortunately some of these same fans have lived long enough to see electric railways undergo a world-wide renaissance, with new systems and extensions cropping up all over. Their hard work in preserving this history has now been more than validated. The changeover from black-and-white to color photography meant a change in approach. When shooting black-and-white, you can expose for the shadows and often retain the highlights, while the opposite is true with color slide film. An overexposed black-and-white negative may still be printable, but with reduced contrast. An overexposed slide will have washed out highlights. 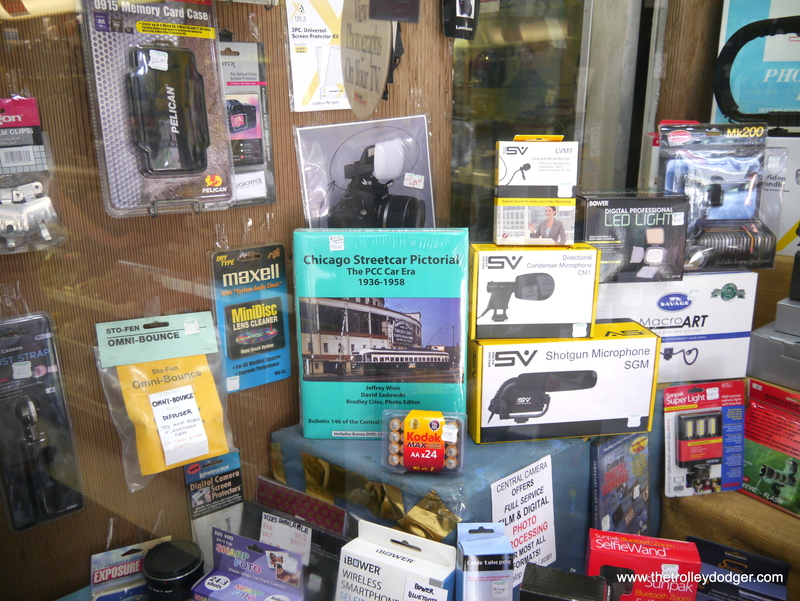 Naturally, over the years, railfan photographers had their favorite camera stores. The biggest and best in Chicago were downtown. Altman’s was legendary and was like a “Noah’s Ark” of camera stores, with two of every camera or lens imaginable– one to show and one to go. I am sure there are still many Chicagoans “of a certain age” who have fond memories of Shutan, Helix, Standard Photo, Lion Photo, Terminal Photo, and many others that are now gone by the wayside. And of these, Central Camera on Wabash somehow remains, after 116 years in business. It has become part of history itself. 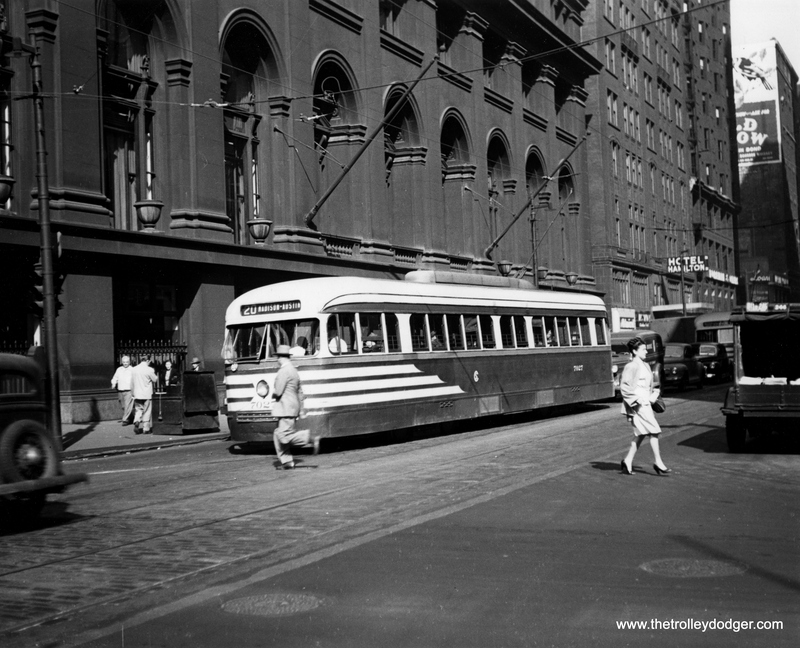 There is a photo of a prewar Chicago PCC streetcar, taken by the late Robert W. Gibson, on page 61 of Chicago Streetcar Pictorial: The PCC Car Era, 1936-1958, with Central Camera in the background. The store is still in the same location today. The book collects the work of many unheralded railfan photographers who all turned out to be, in their own way, both transit historians and historic preservationists. As a co-author, I was recently pleased to discover that Central Camera is now selling copies of the Chicago Streetcar Pictorial and has one on display in their front window, alongside the old Kodak Six-Twenty folding camera, the twin-lens Rolleiflexes, Leicas and such. Yes, I know that in the long run, it is an uphill battle to keep up with the Amazons of the world. But even in the 21st century, shouldn’t there be enough room left in this world for a few old-fashioned camera stores? PS- You can help keep our own doors open by checking out the many fine offerings in our Online Store. You can also make a donation there. We thank you for your support. 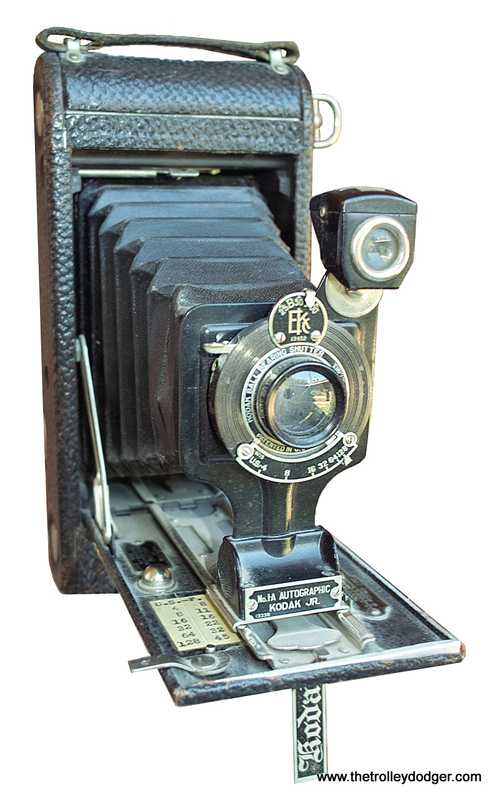 A typical folding camera of the early 20th century, this Kodak Autographic camera too very large size 116 black-and-white roll film. The “autographic” feature allowed the photographer to write notes on the actual film negative itself through a door on the back of the camera. The roll film was protected by a paper backing. 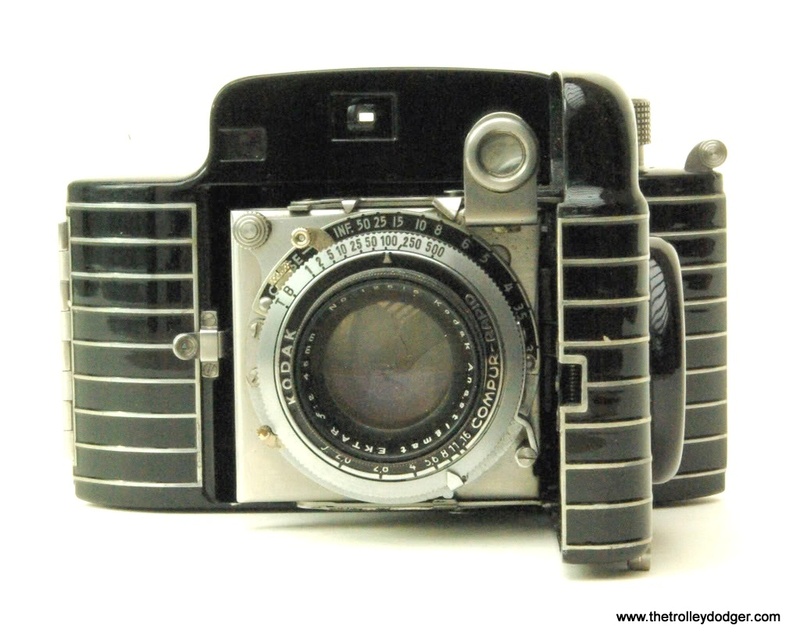 This streamlined Bakelite Kodak Bantam camera, which used size 828 film, was the state of the art in 1938 but few railfans could afford to buy one. 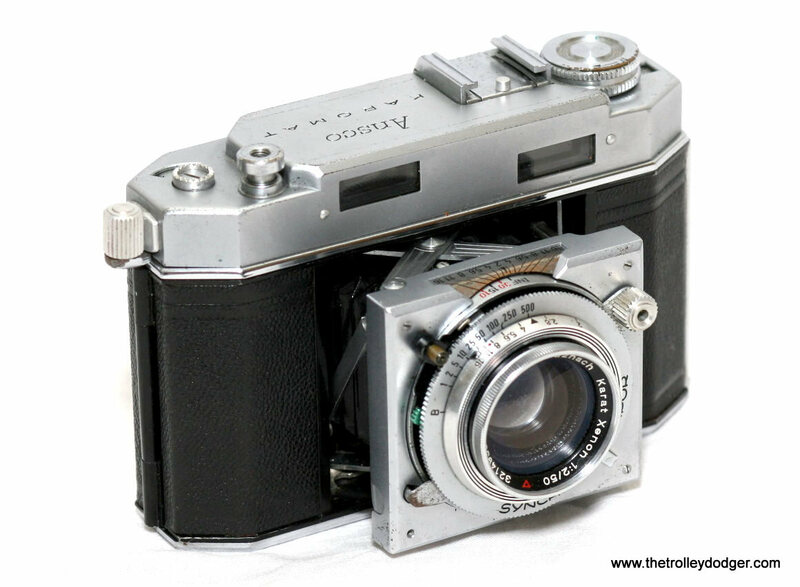 Truman Hefner took many great pictures with a German Karomat camera similar to this one, which has a high-quality Schneider lens. 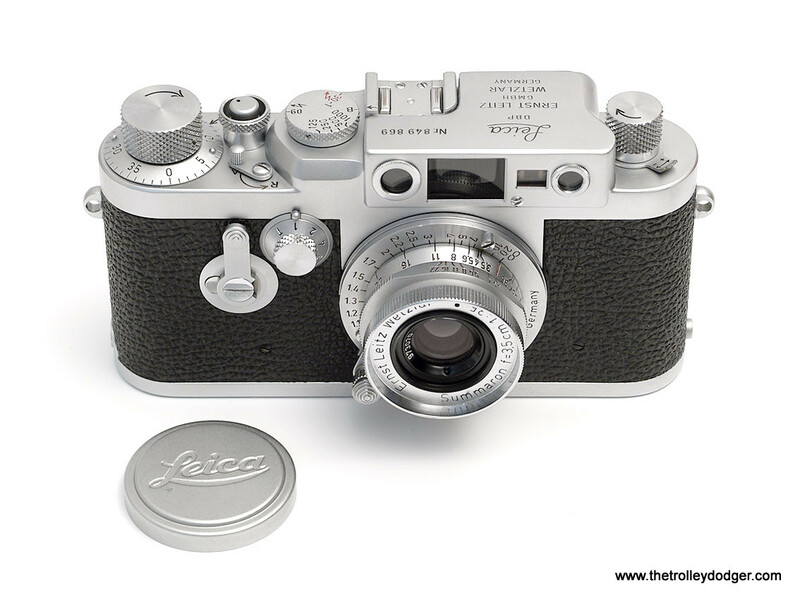 The late Bill Hoffman’s last camera was a late 1950s screw-mount Leica IIIg similar to this one. 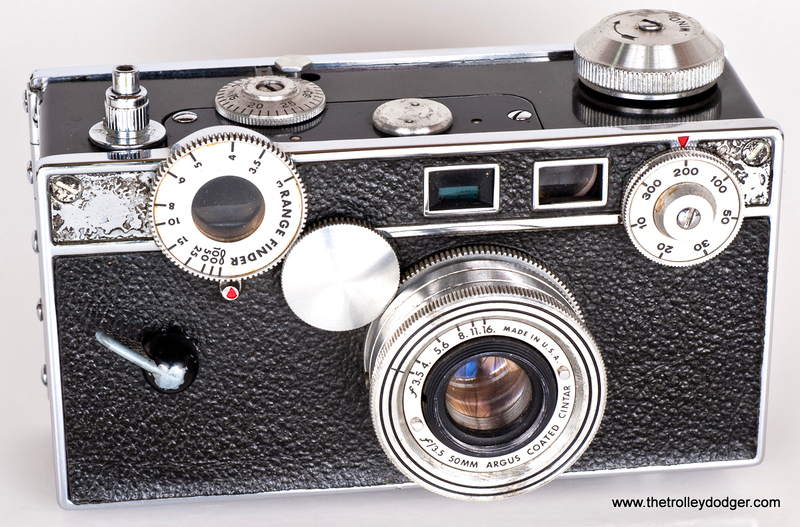 After his passing in the late 1980s, I received his Leica as a gift. 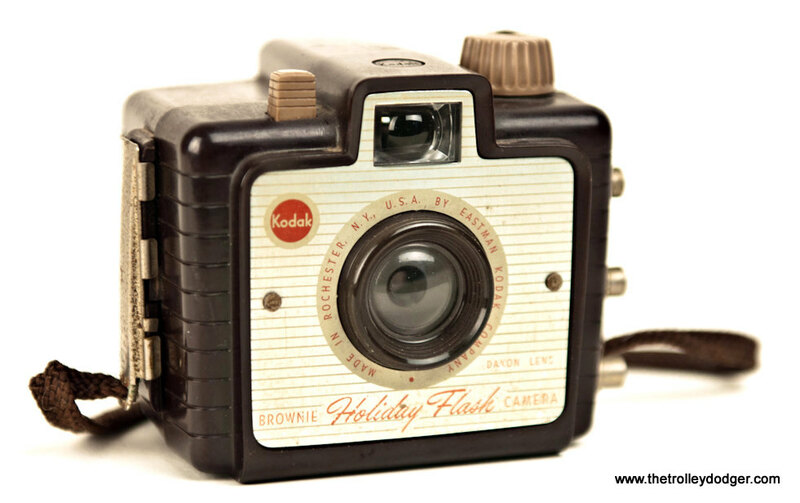 My own first camera, a Kodak Brownie Holiday Flash camera, circa 1963. It took size 127 roll film, then the most popular format on the market. A Kodak Brownie 8mm movie camera. 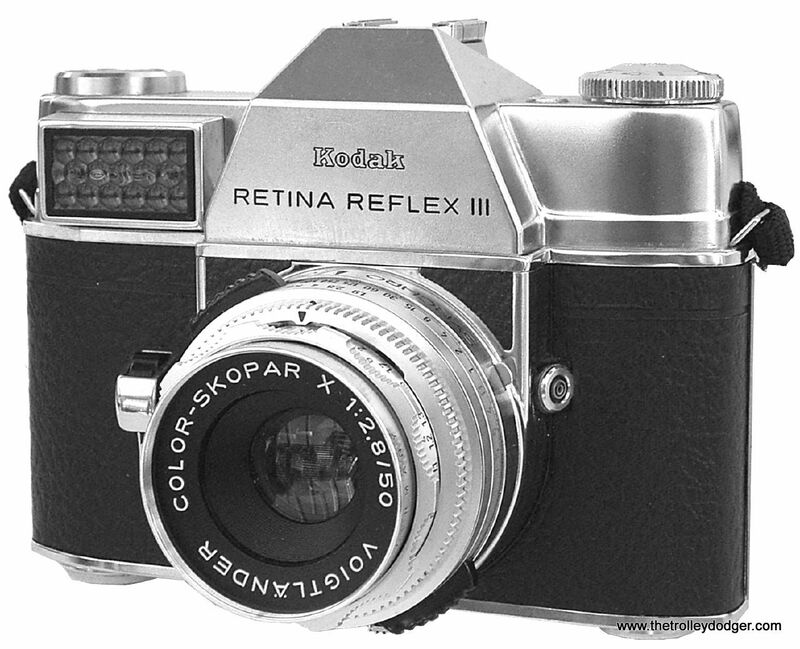 For many years, Ray DeGroote took pictures with a German circa-1965 Kodak Retina Reflex III like this one. The gridlike patch at top left is a chemical-based light meter. 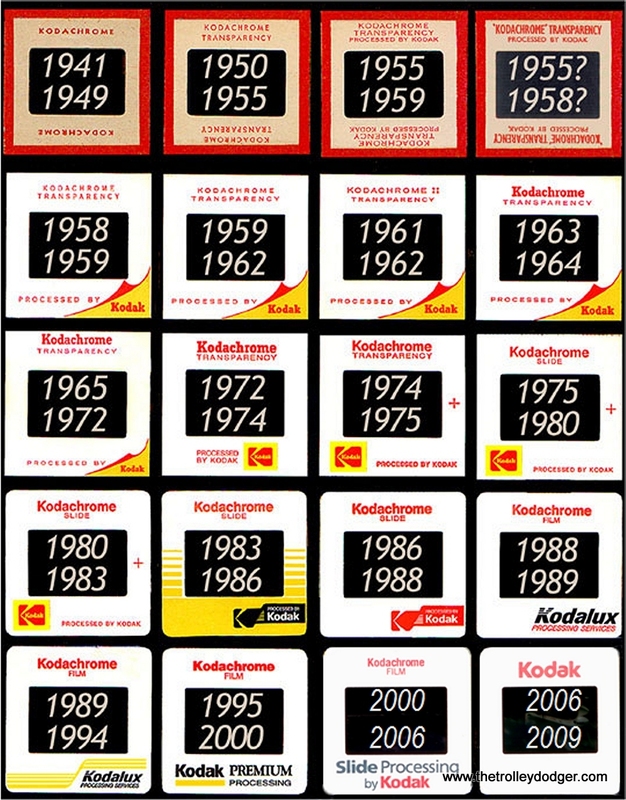 Even when there is no other dating information on an original 35mm Kodachrome slide, it can be dated to some extent by the type of mount used. 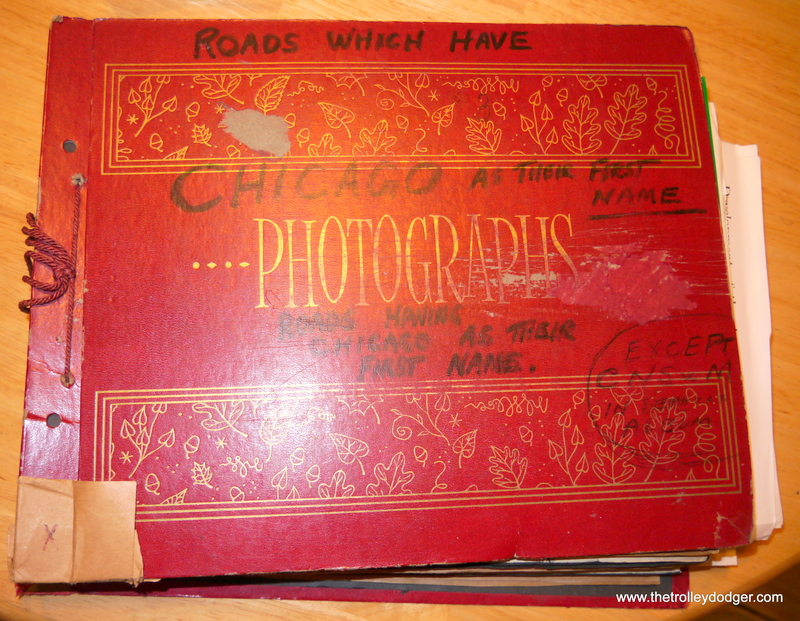 One anonymous railfan’s album on clippings, titled “Roads which have Chicago as their first name.” This title is written out twice, followed by “except CNS&M in separate album.” Interestingly, the album has a section on the Aurora, Elgin & Fox River Electric, which does not have Chicago in its first name. 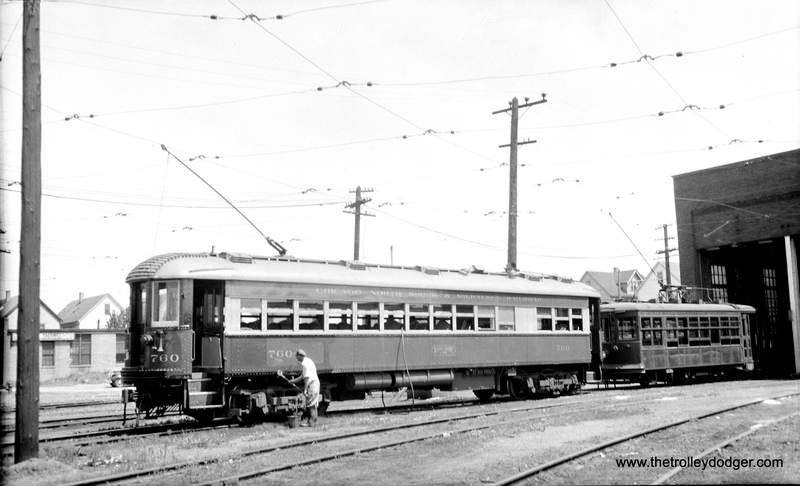 Car 102 of the the Elgin Belvidere & Rockford sits forlornly in Marengo in this June 1937 photograph. By then, the line, which quit service on March 9, 1930, had been abandoned for more than seven years. Owner Bion J. Arnold kept these cars in storage in the futile hope that a buyer could be found. We can thank the unknown photographer who preserved this small slice of history. Elgin Belvidere & Rockford car 203 was built by St. Louis Car Company in 1906. It was 31 years old when this photo was taken in 1937 in Marengo. A portion of the Elgin & Belvidere interurban right-of-way now serves as the main line for the Illinois Railway Museum in Union. An original Elgin & Belvidere motorman lived long enough to operate a car over the new right of way when the museum began operations here in the 1960s.